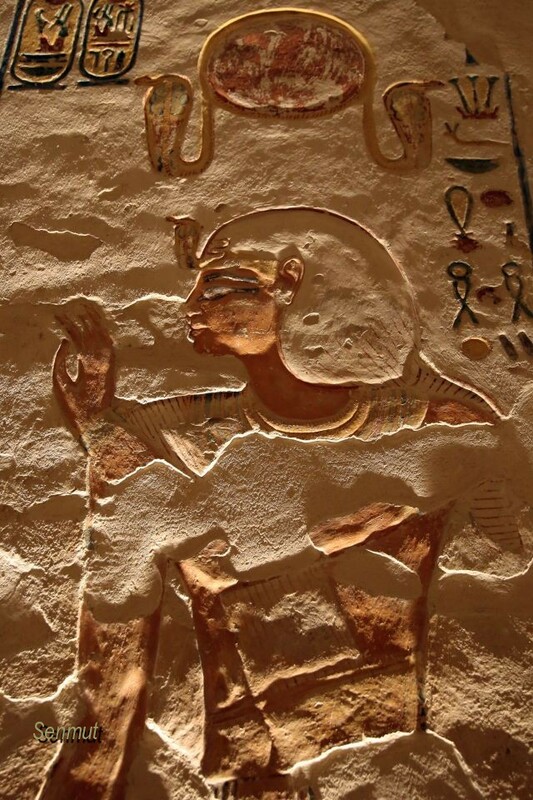 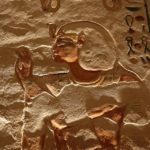 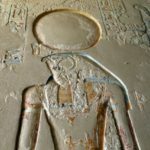 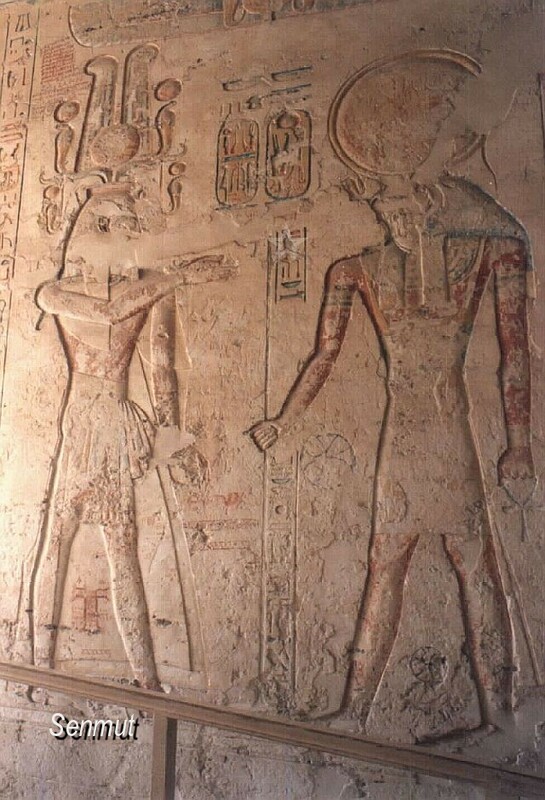 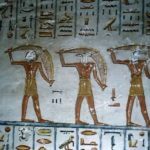 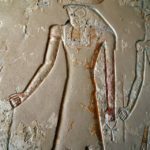 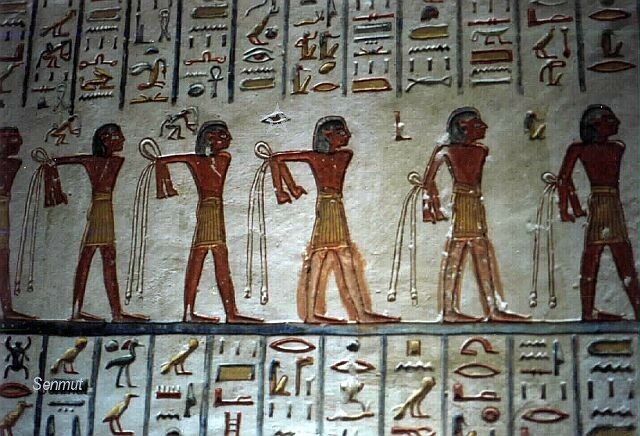 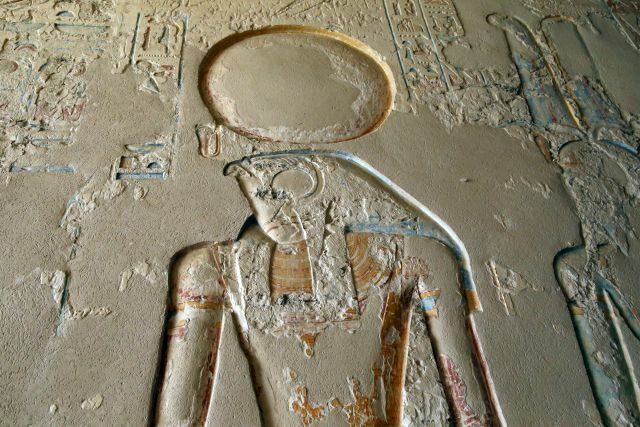 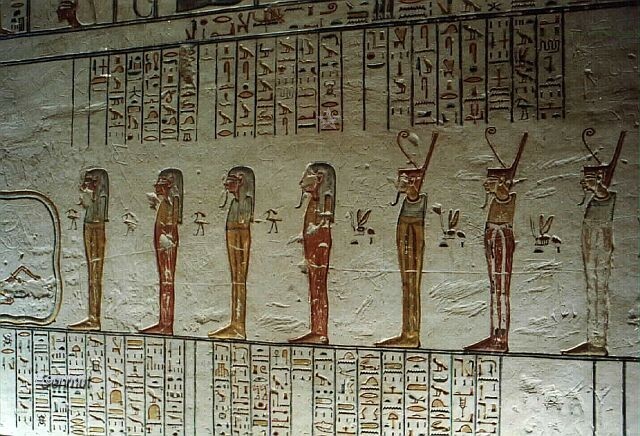 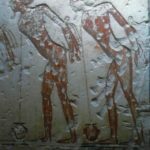 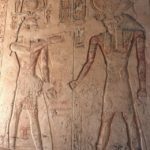 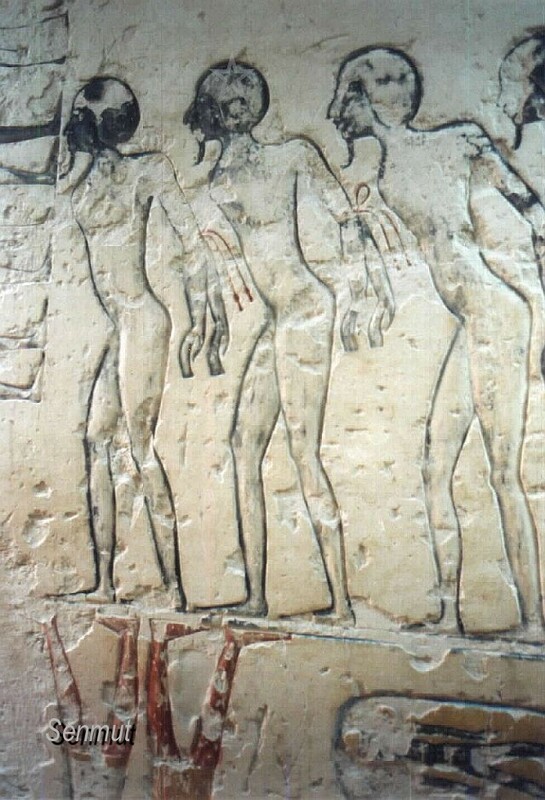 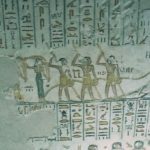 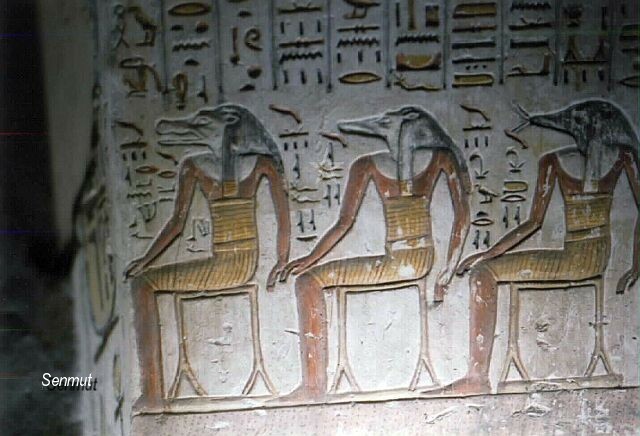 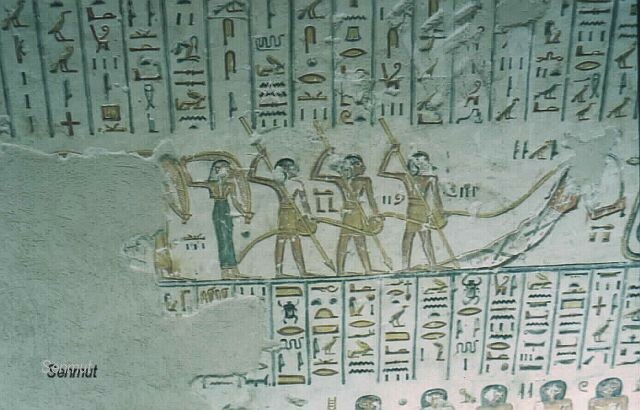 Ramses VI was a son of Ramses III and Iset-Ta-Hemdjert, and the fifth farao of the 20th dynasty. 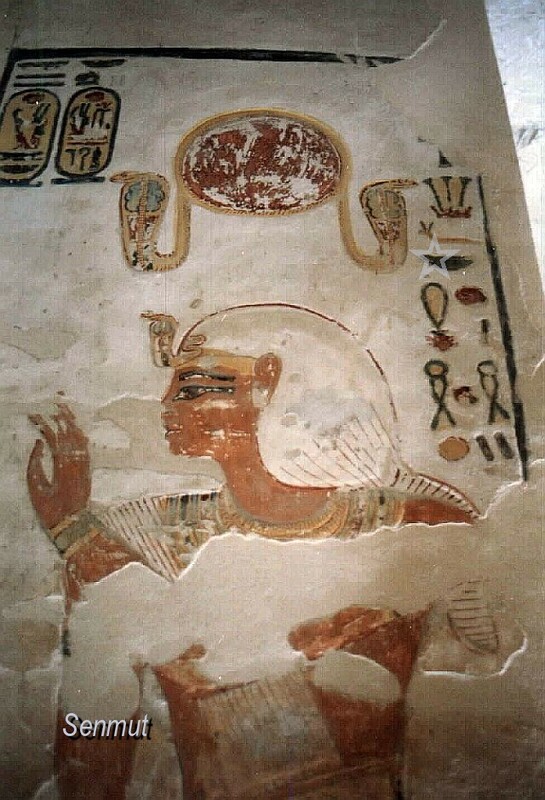 The chief queen was Nubkhesbed. 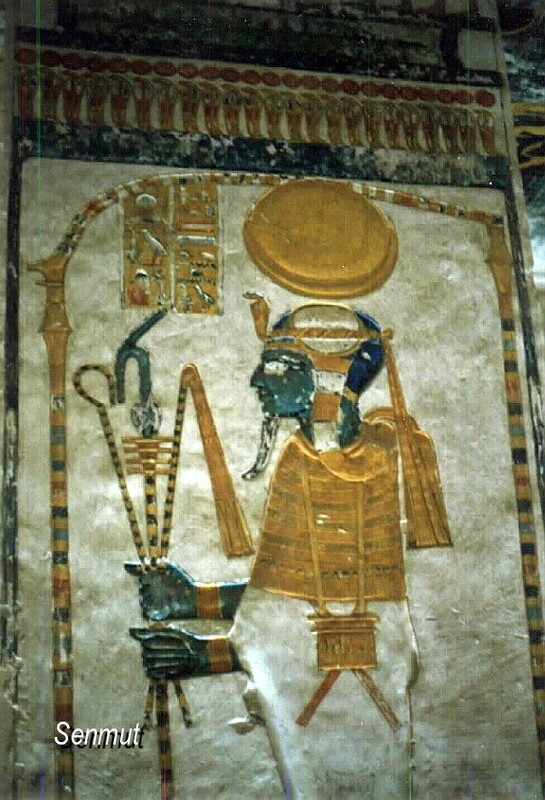 His reign suffered under the growing power of the Amen priesthood, which lasted 8 years. 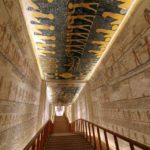 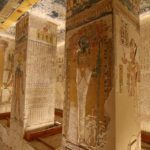 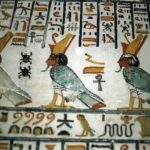 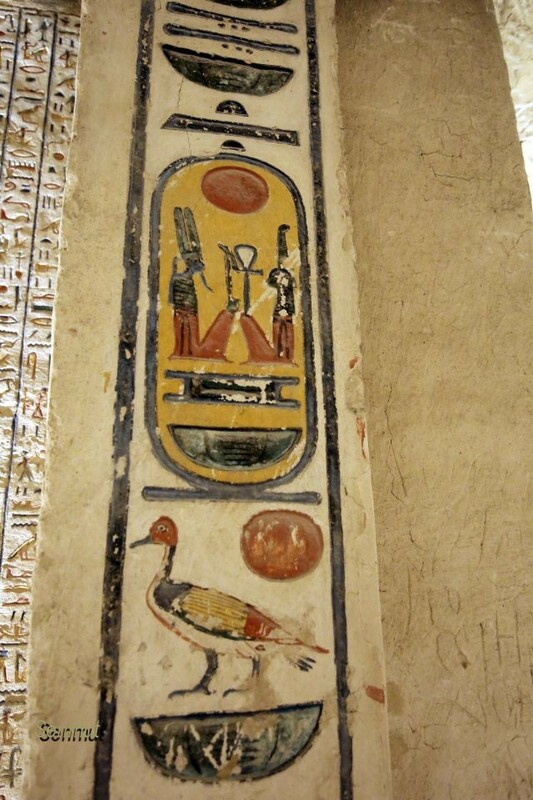 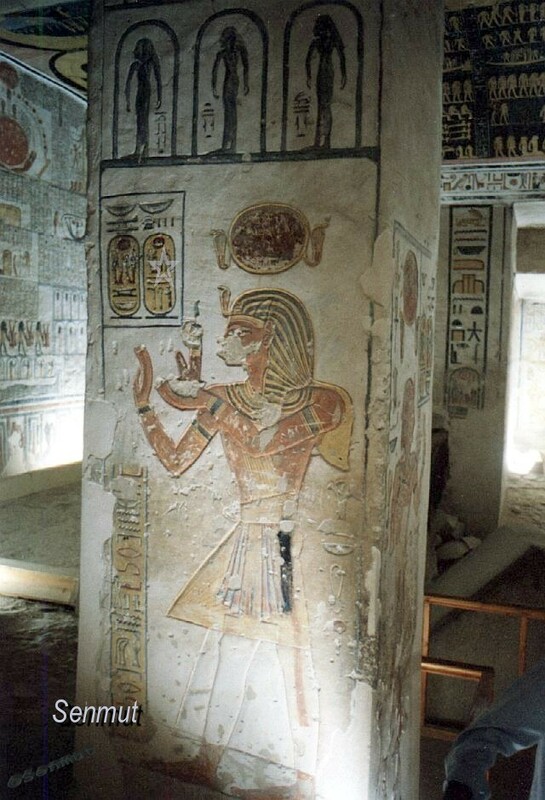 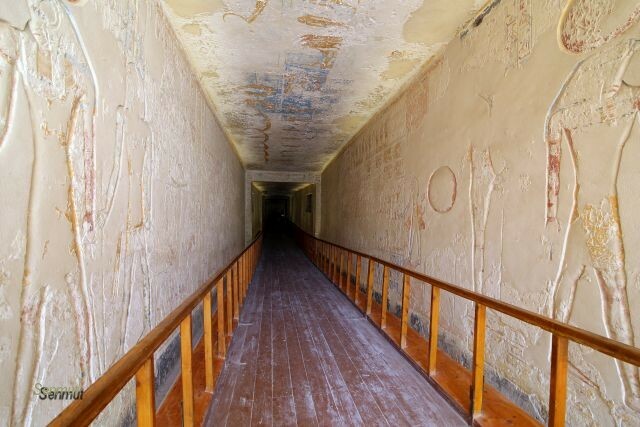 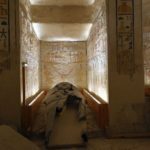 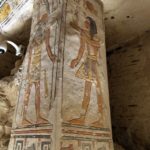 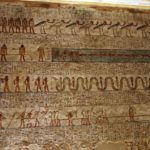 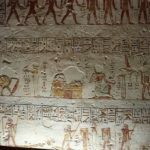 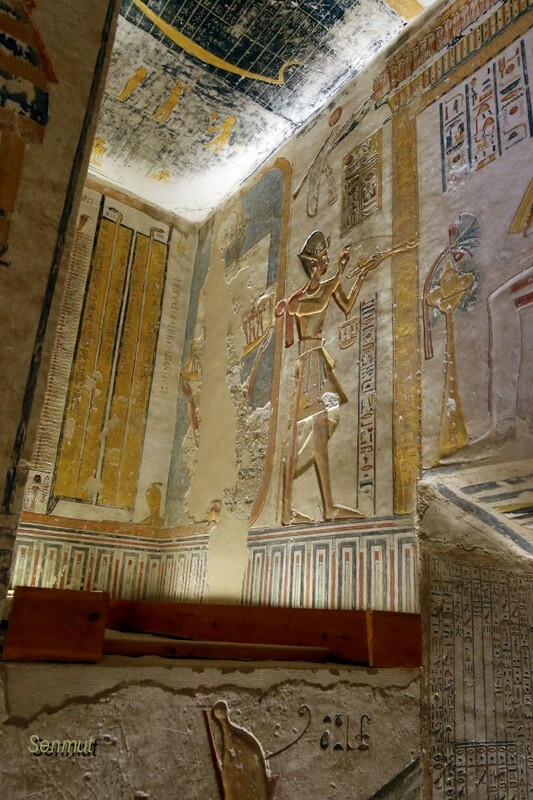 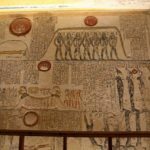 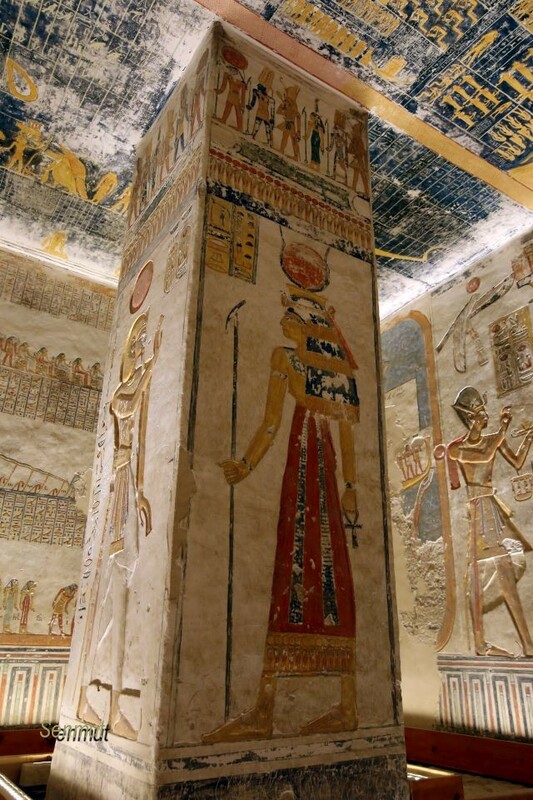 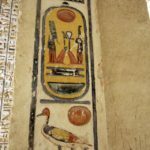 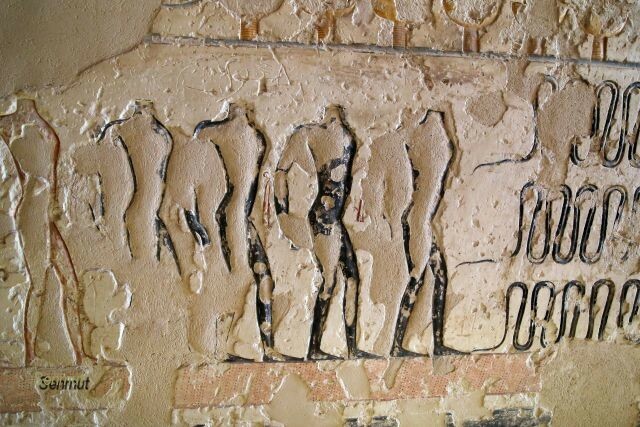 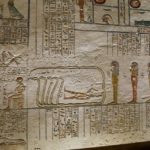 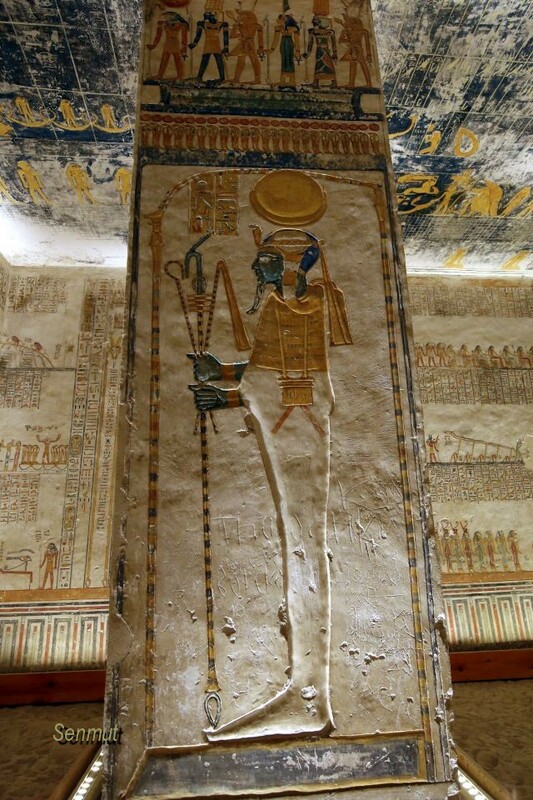 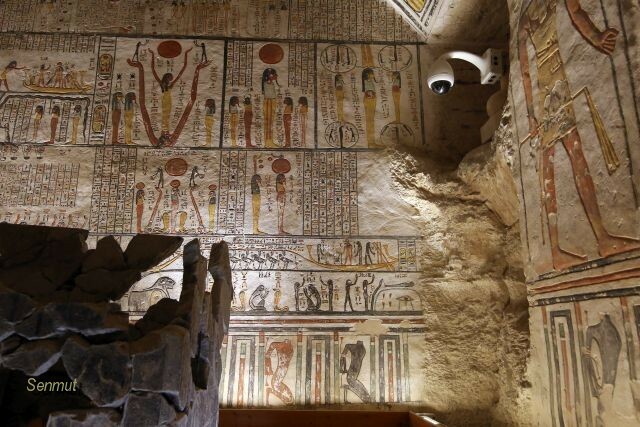 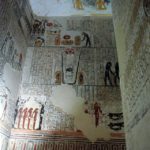 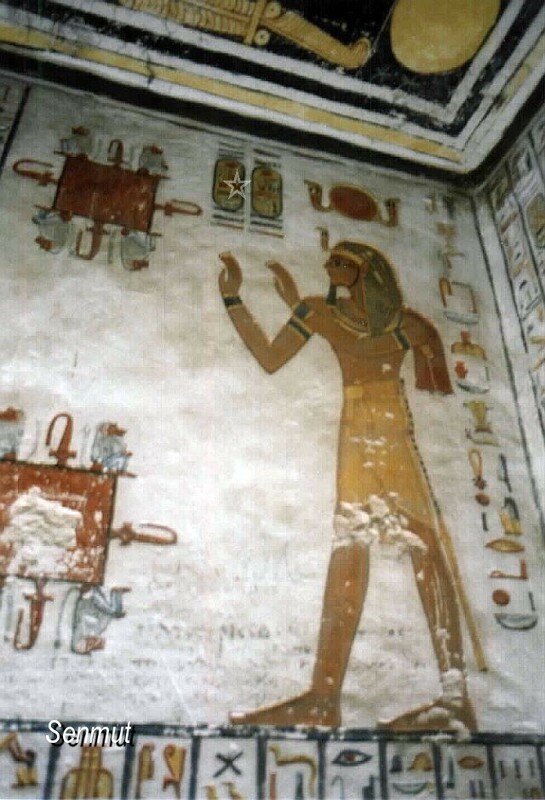 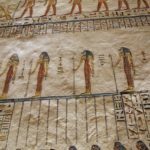 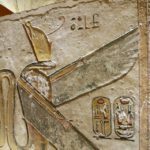 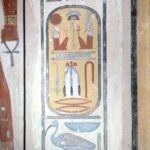 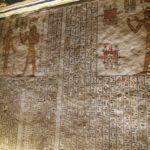 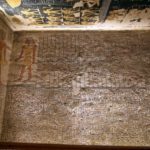 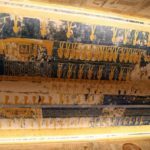 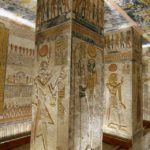 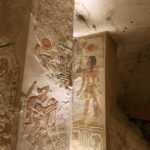 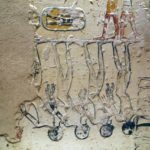 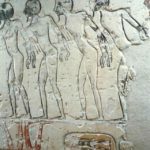 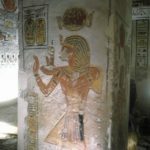 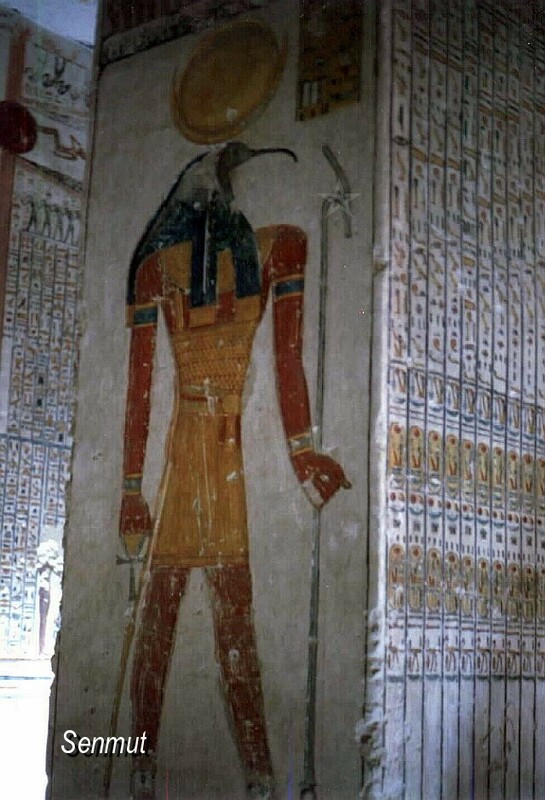 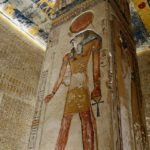 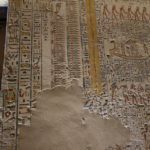 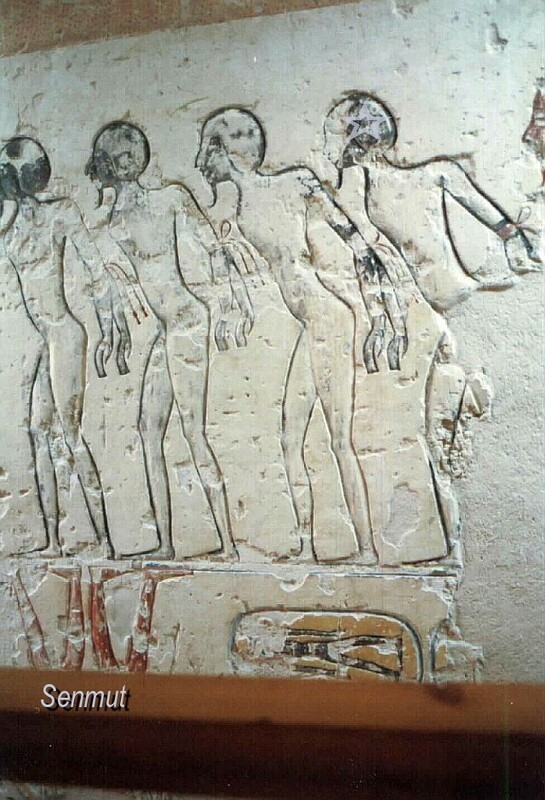 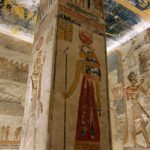 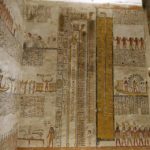 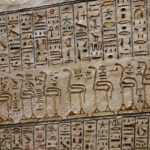 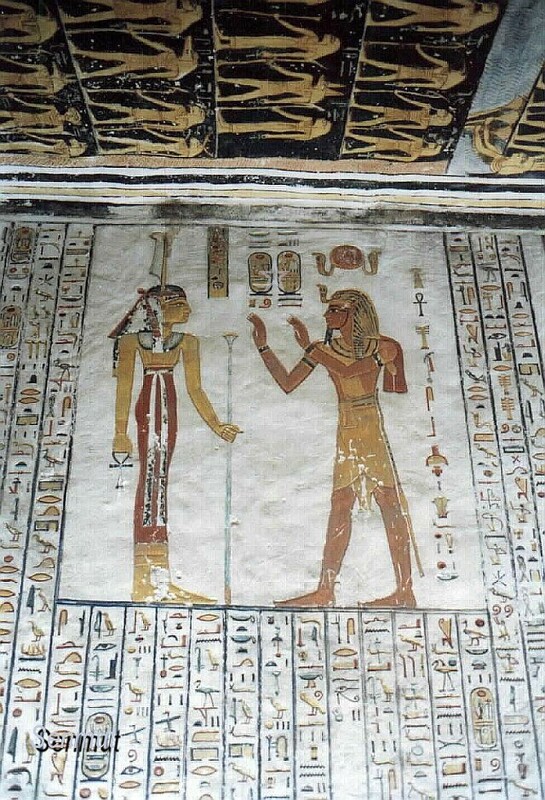 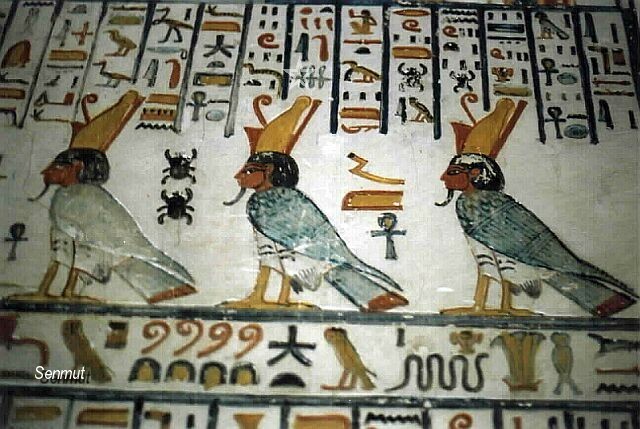 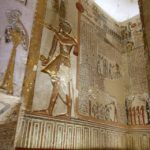 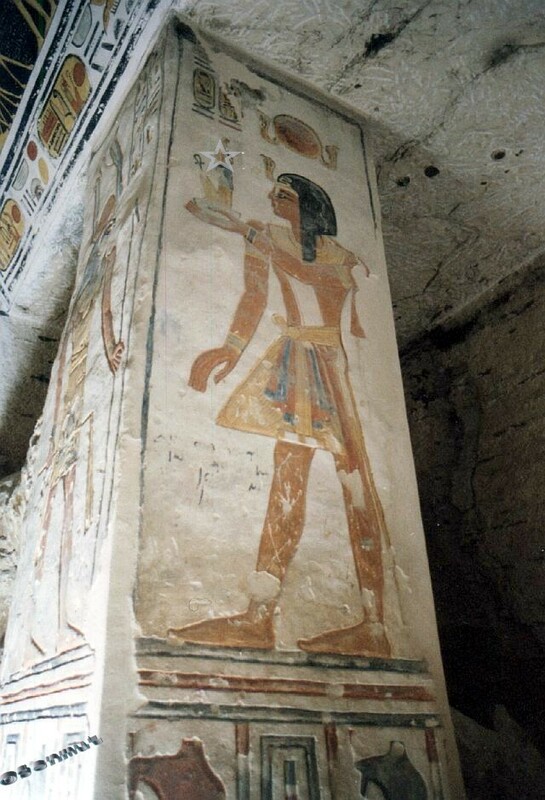 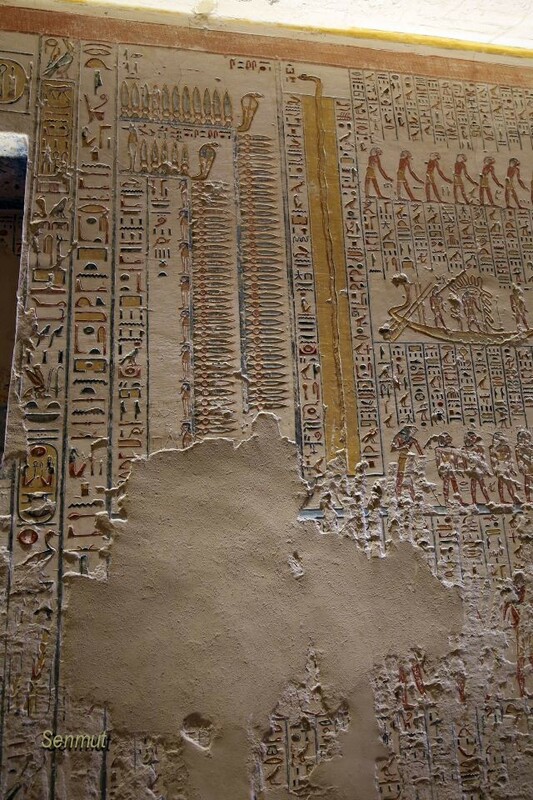 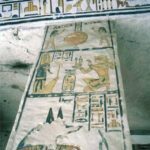 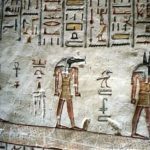 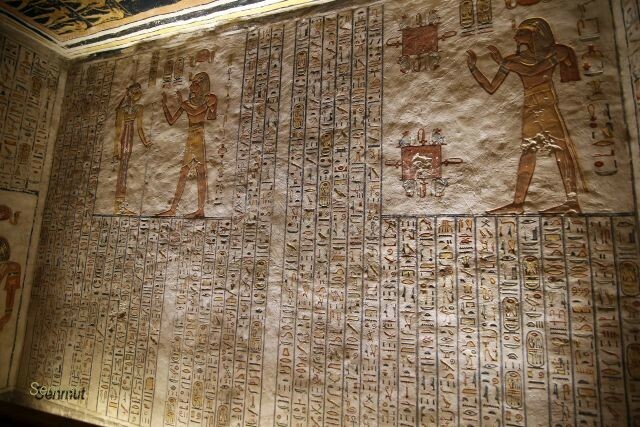 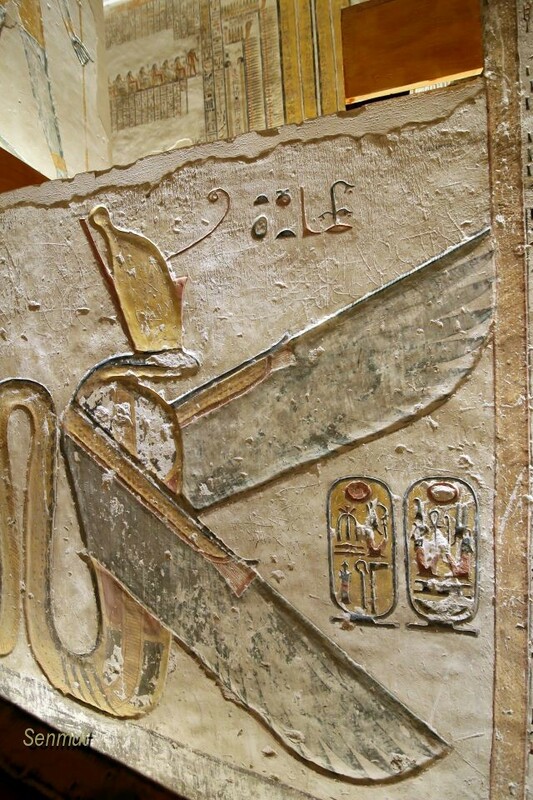 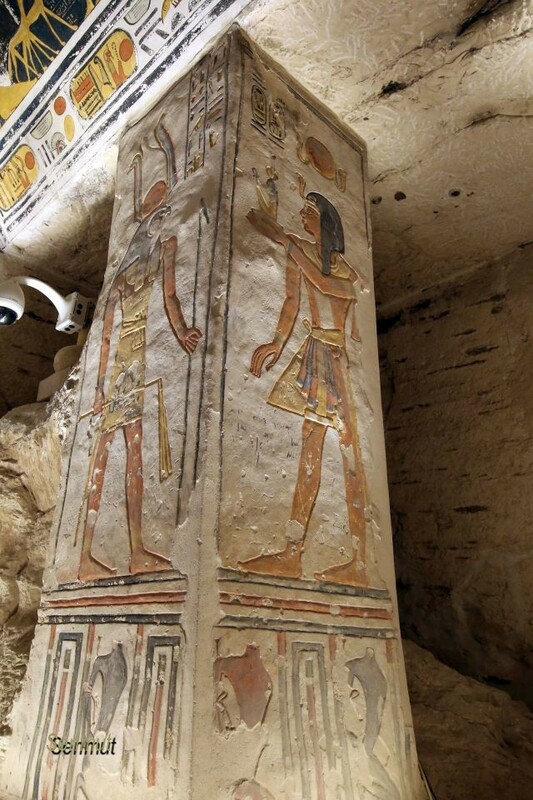 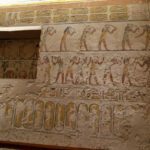 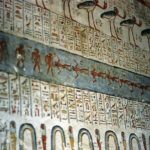 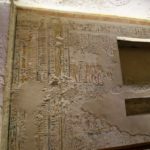 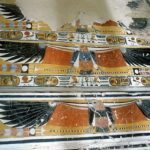 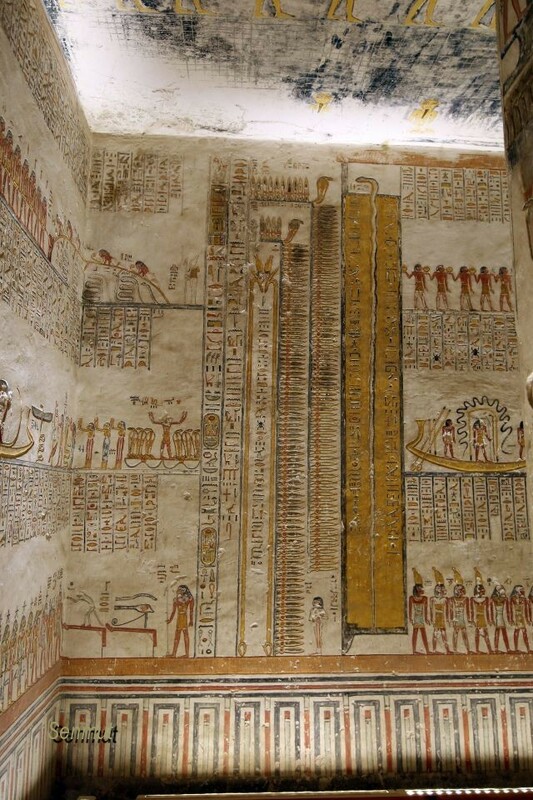 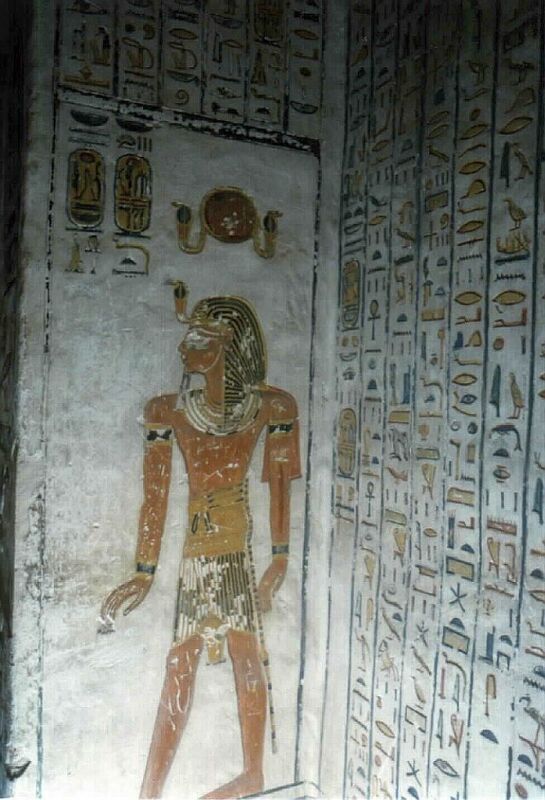 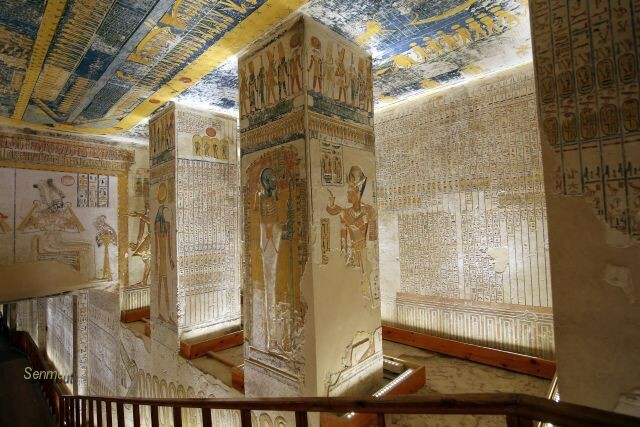 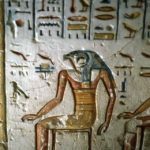 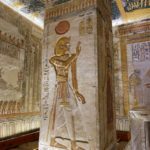 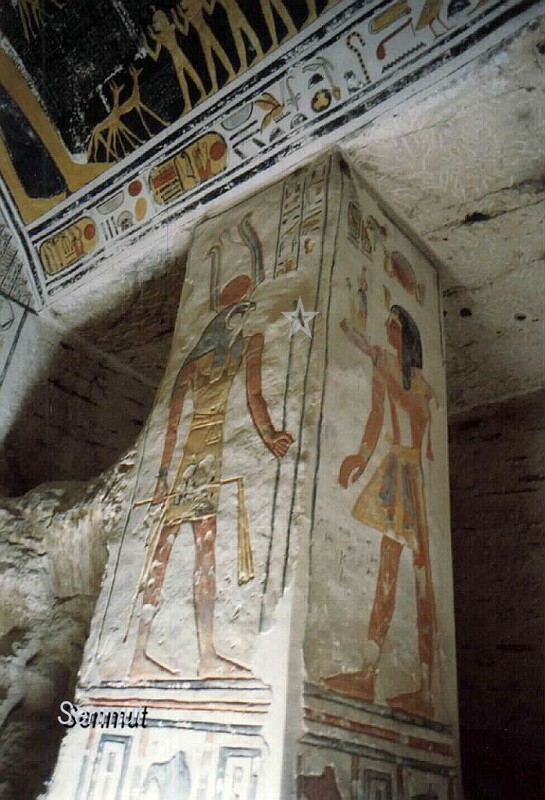 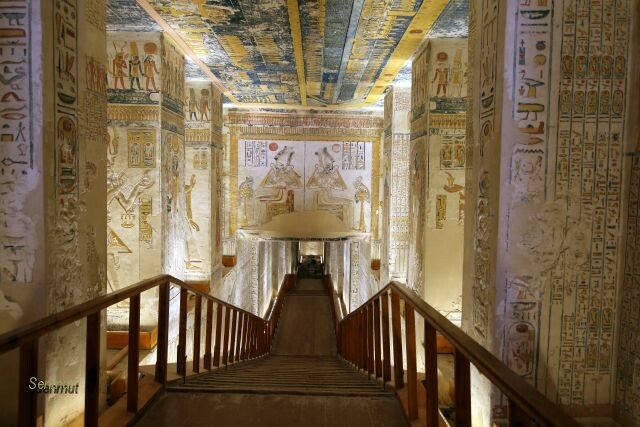 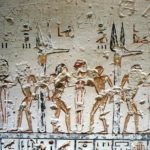 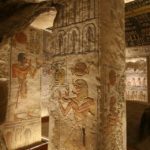 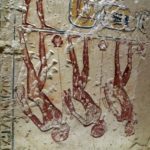 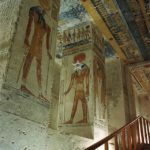 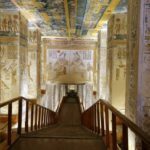 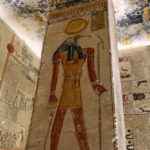 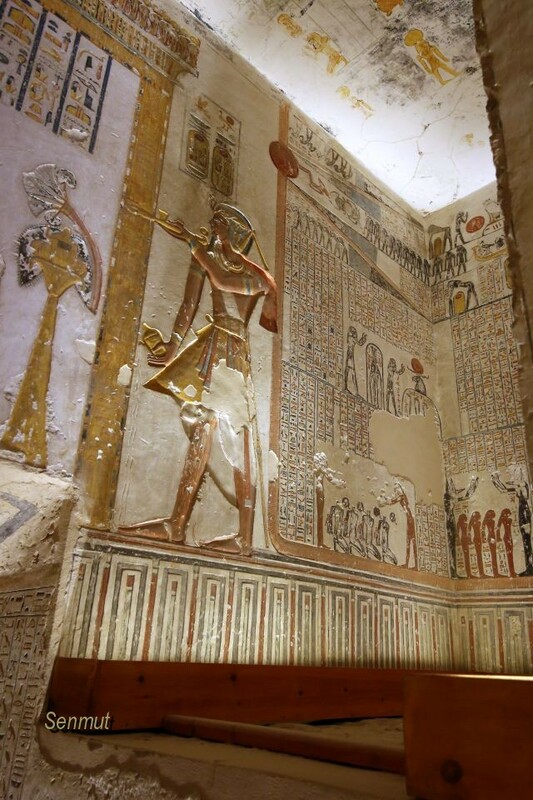 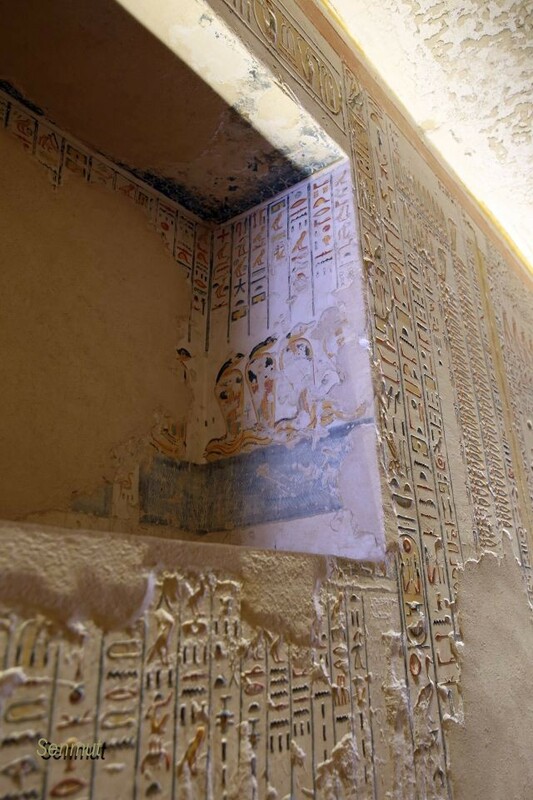 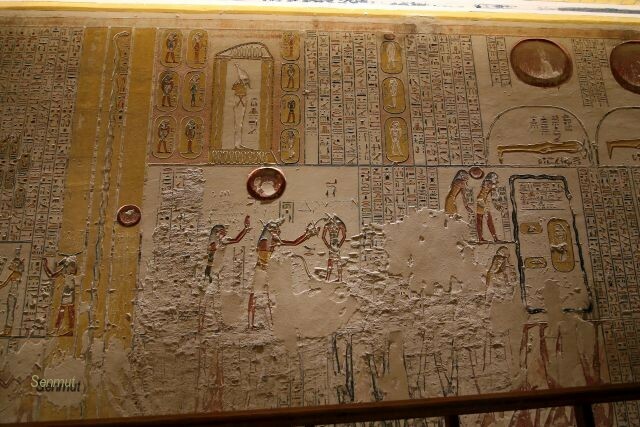 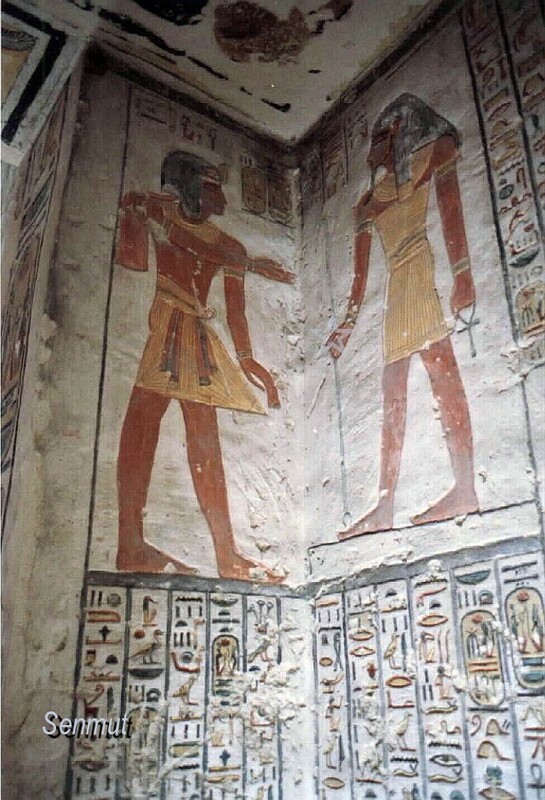 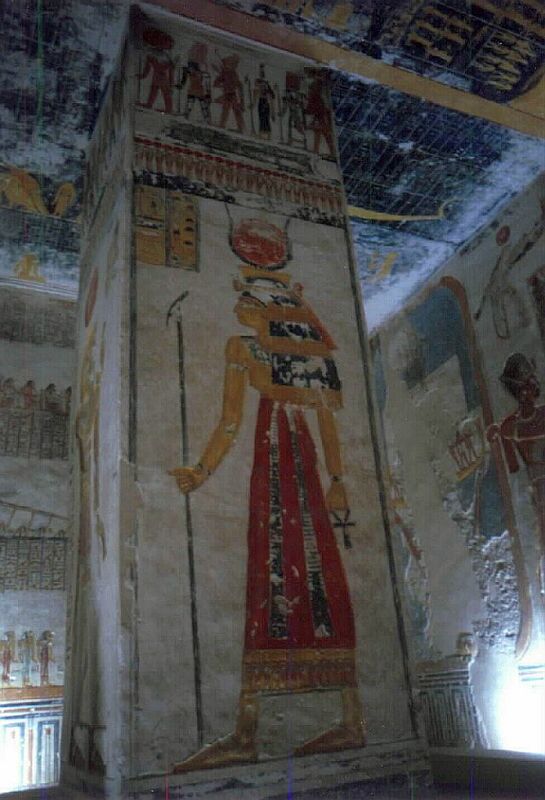 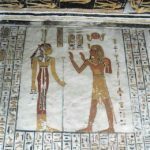 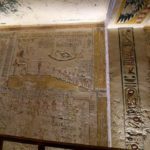 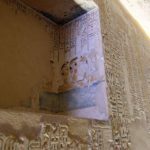 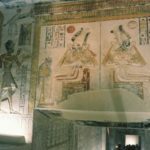 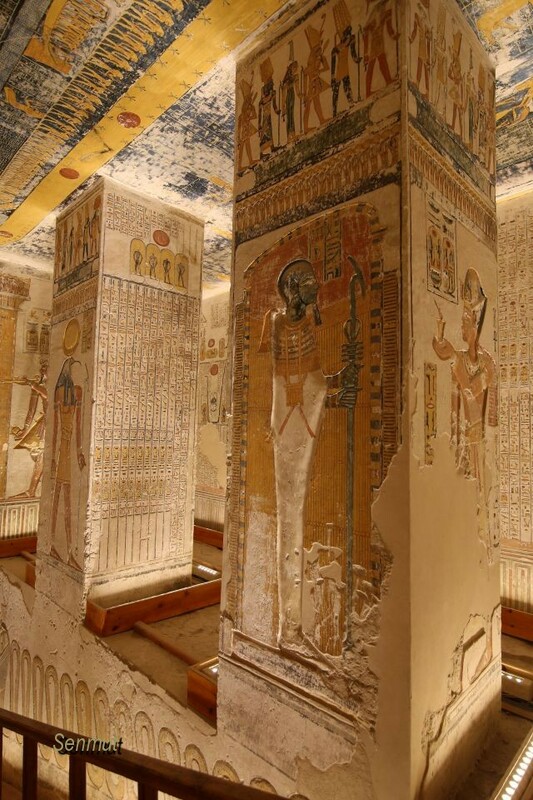 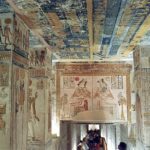 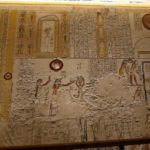 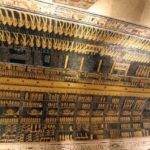 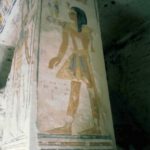 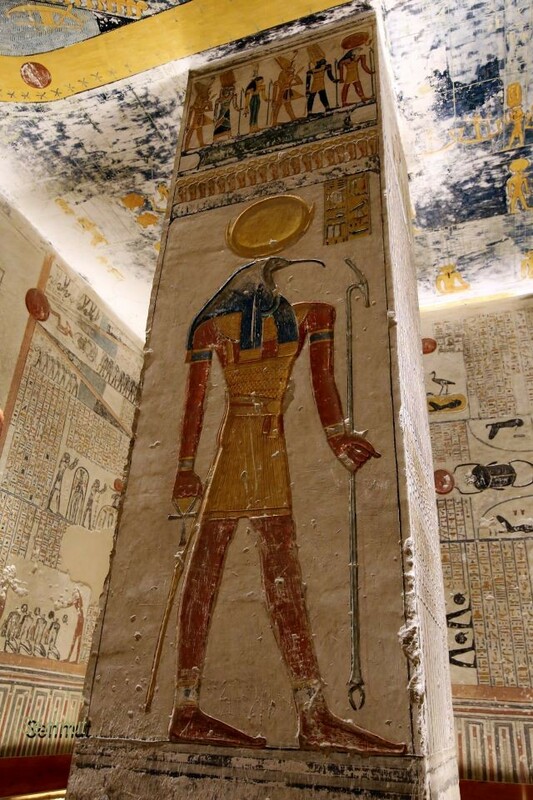 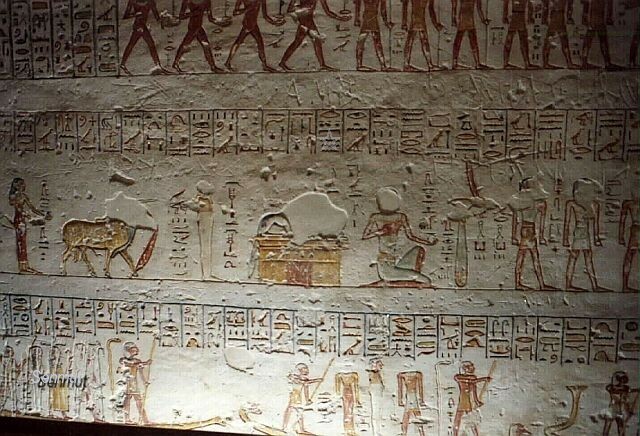 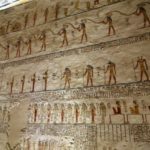 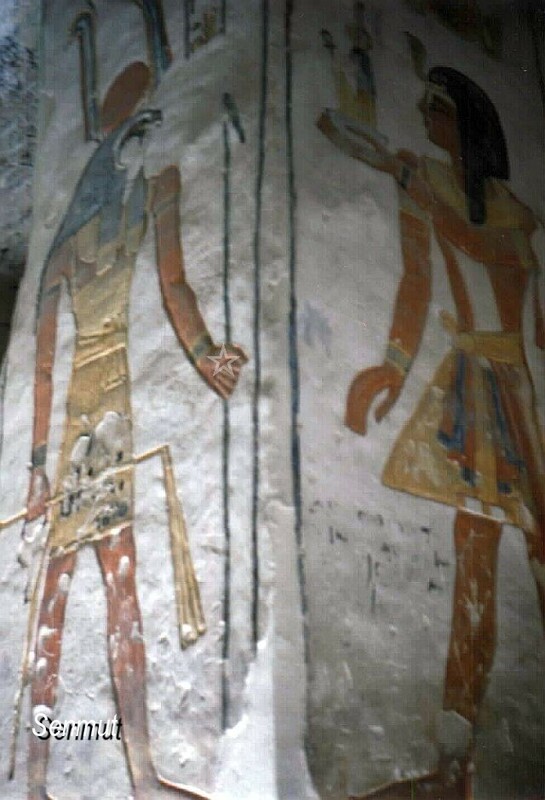 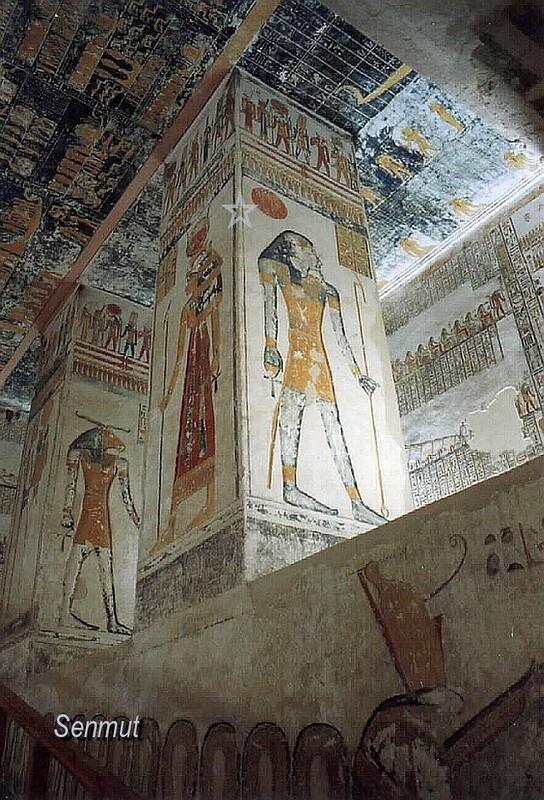 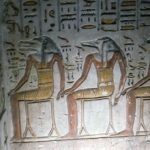 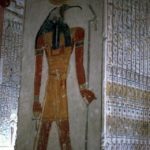 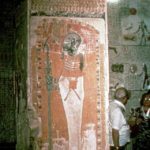 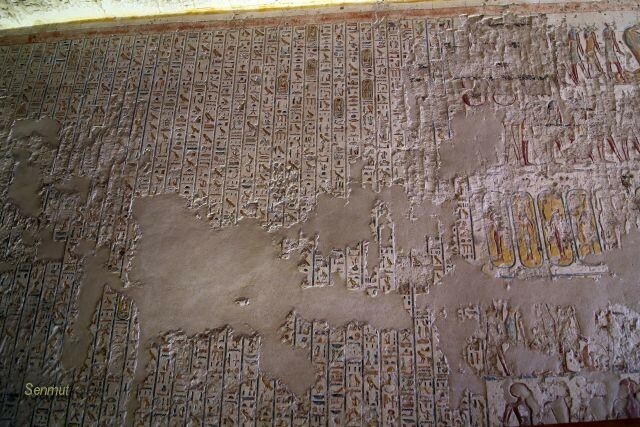 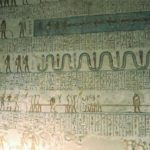 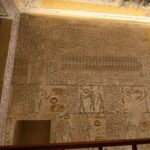 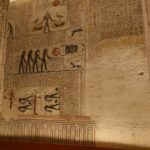 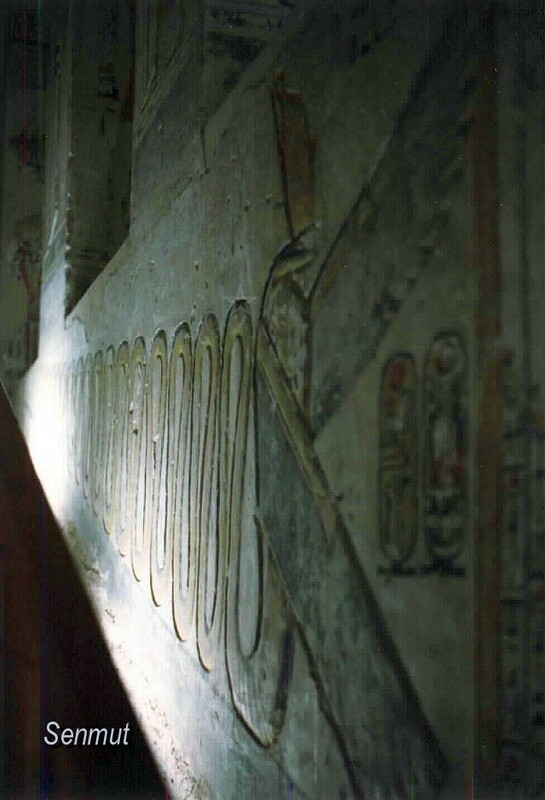 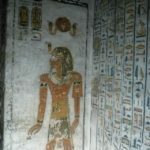 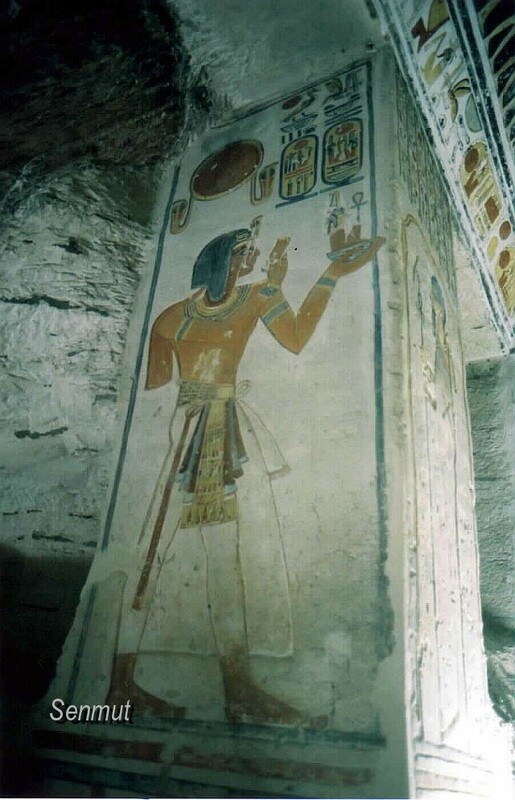 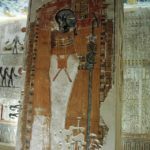 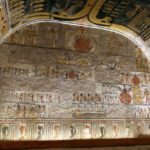 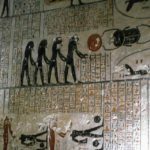 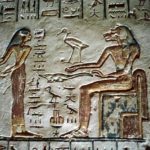 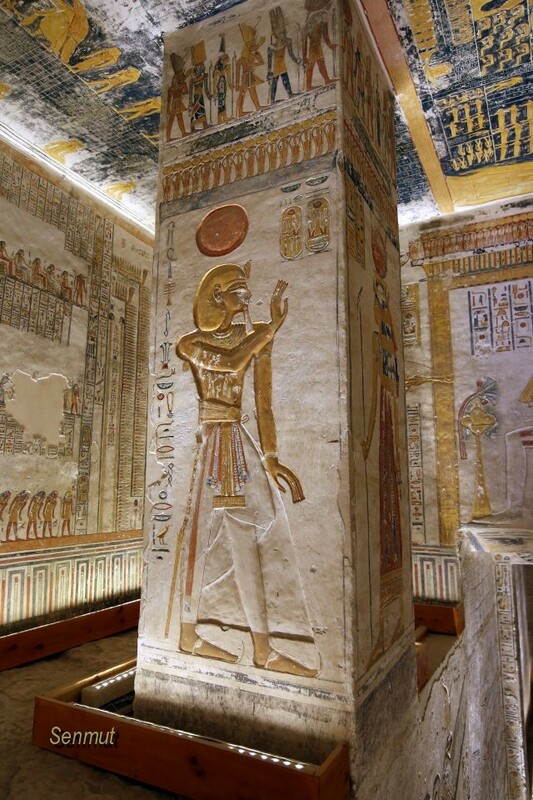 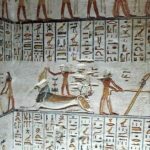 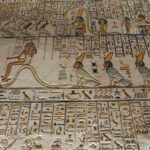 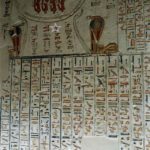 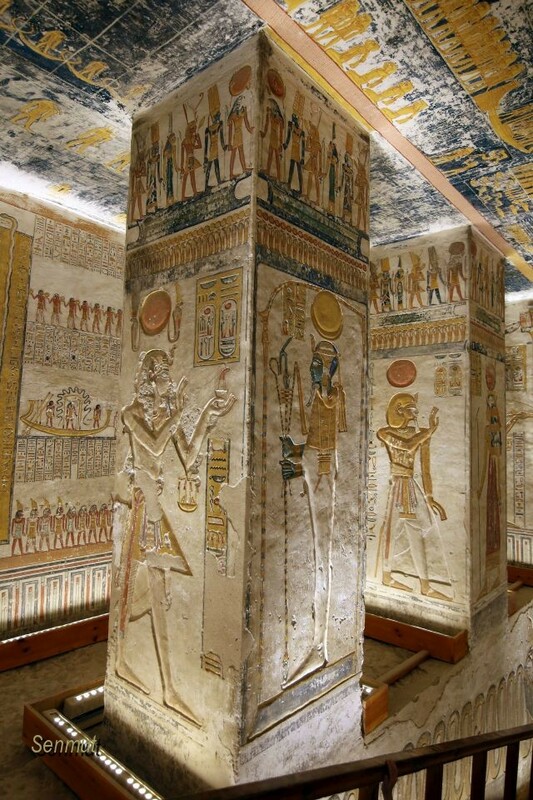 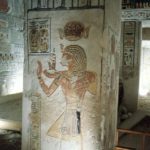 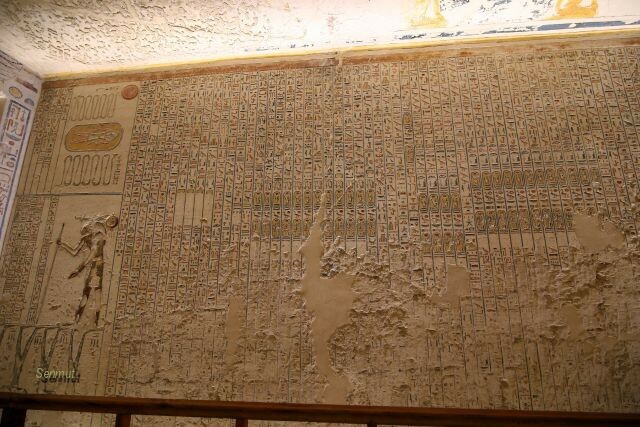 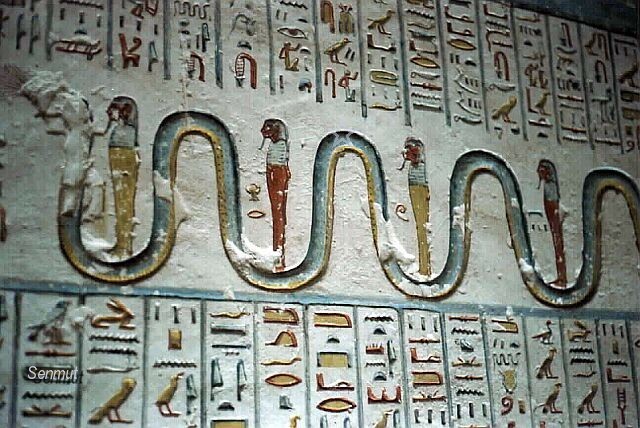 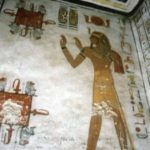 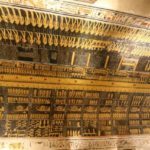 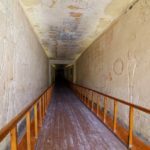 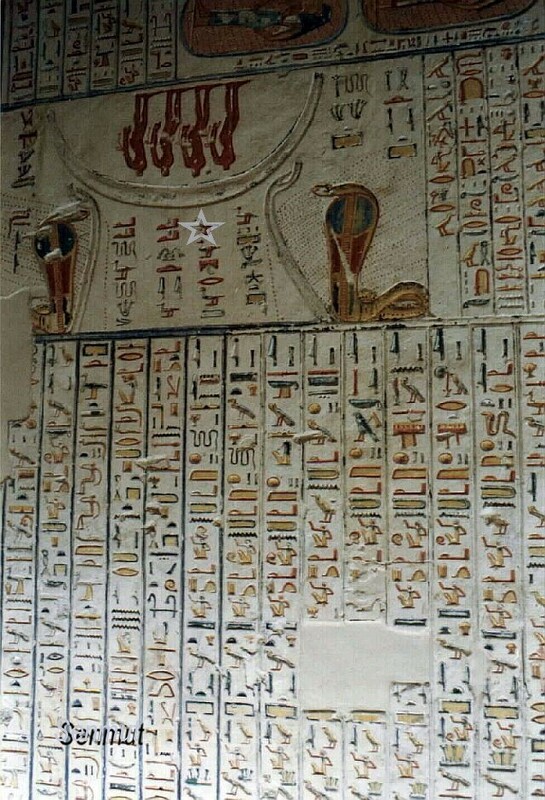 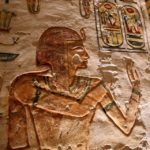 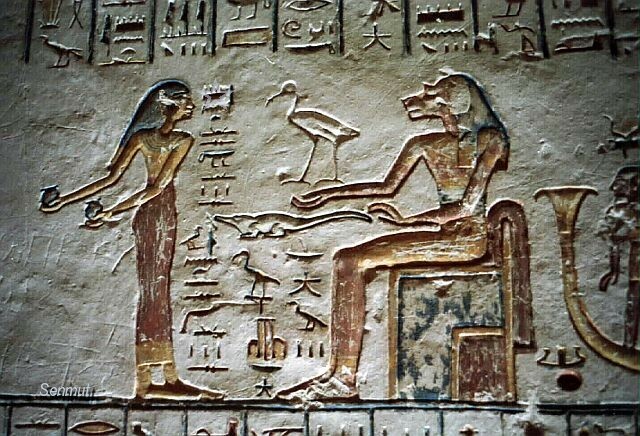 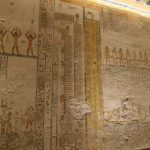 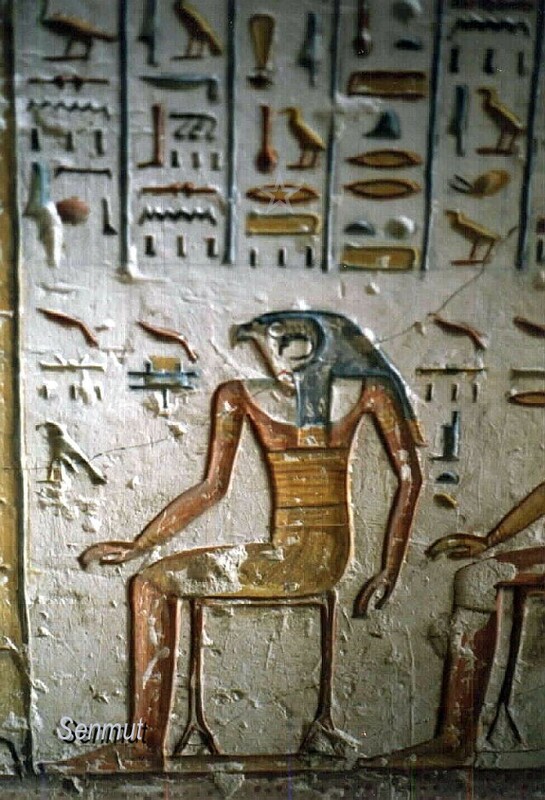 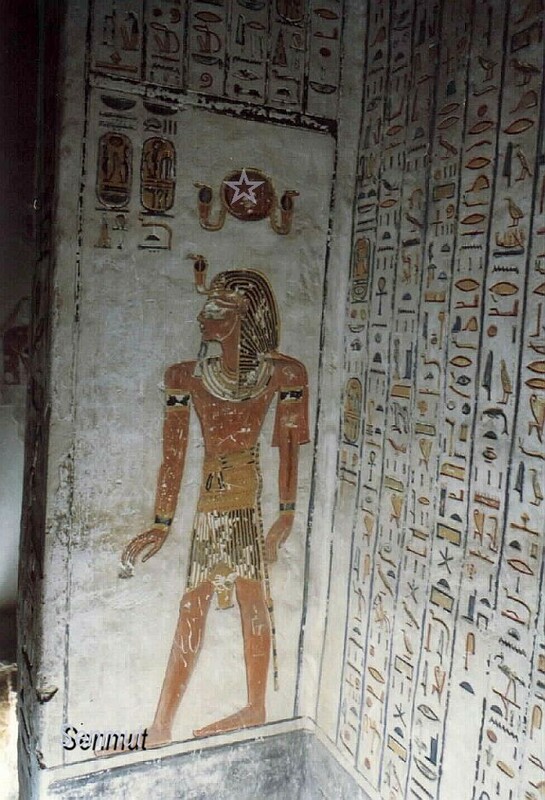 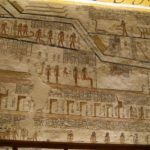 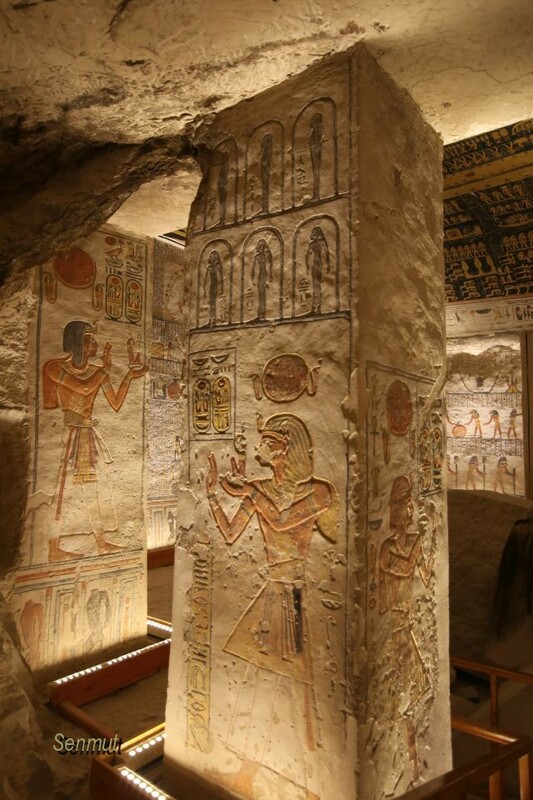 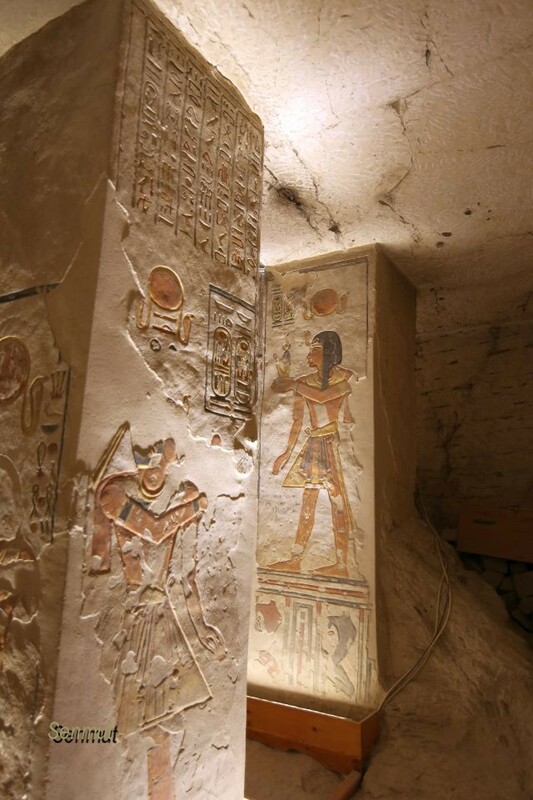 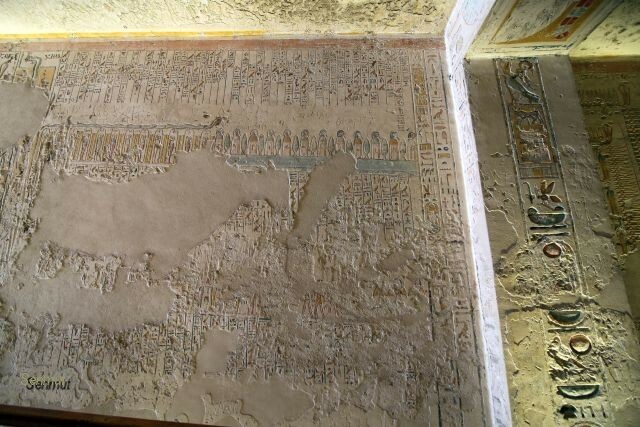 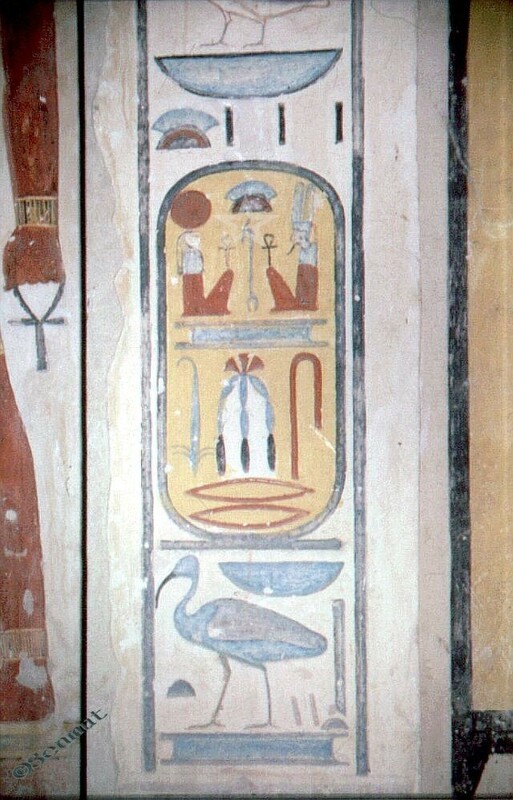 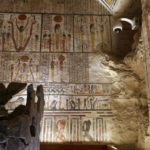 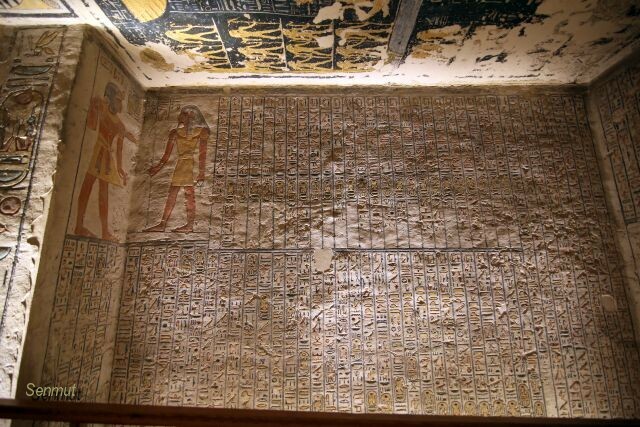 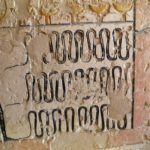 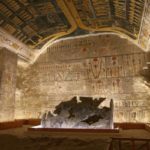 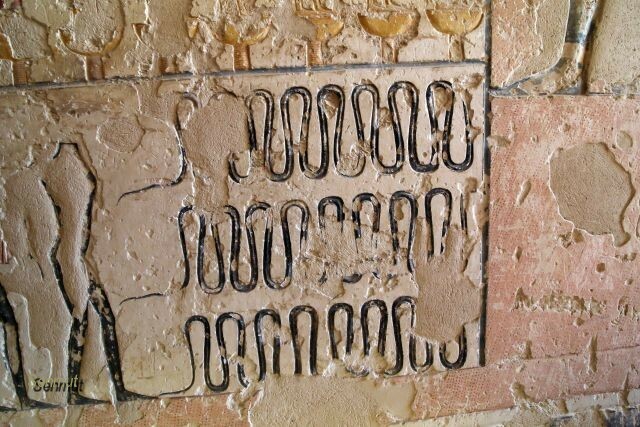 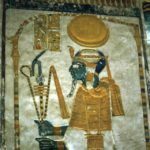 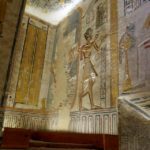 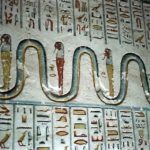 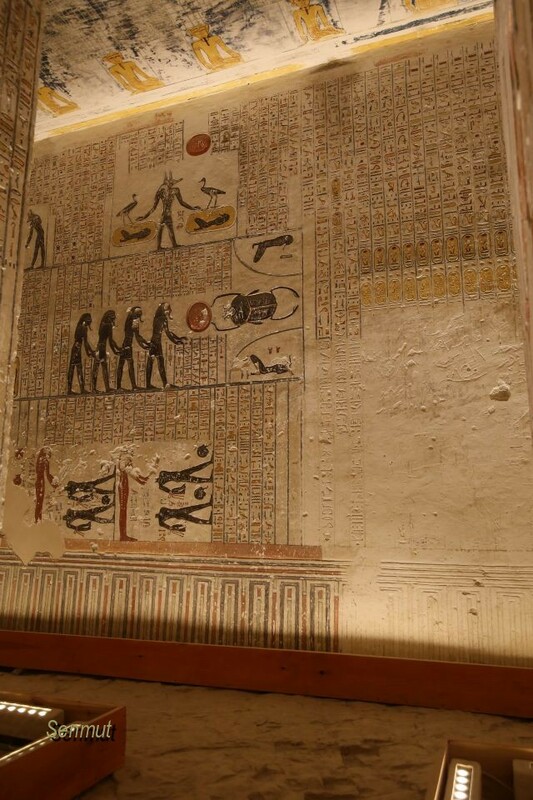 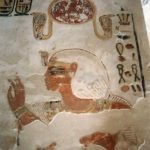 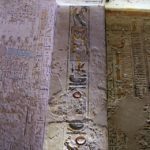 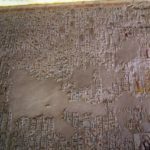 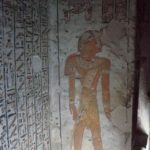 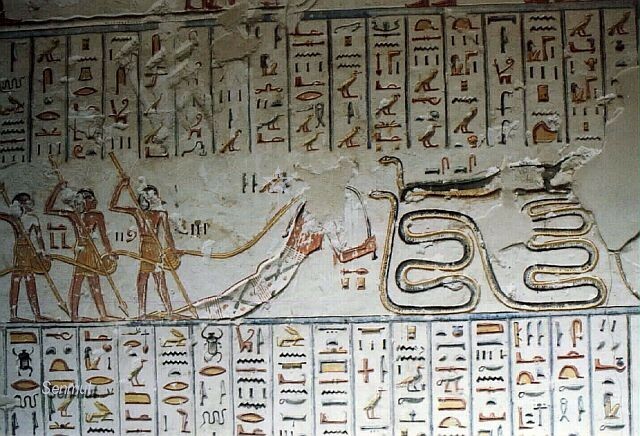 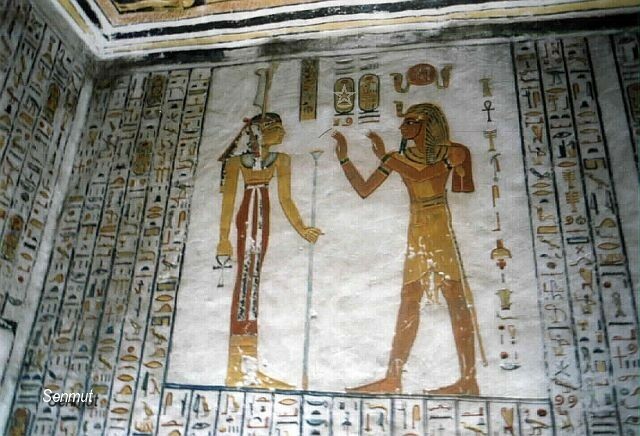 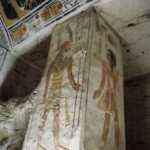 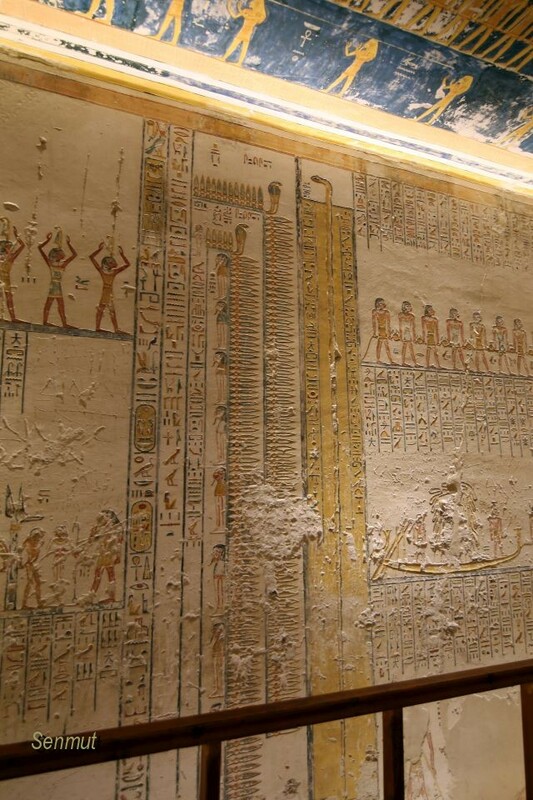 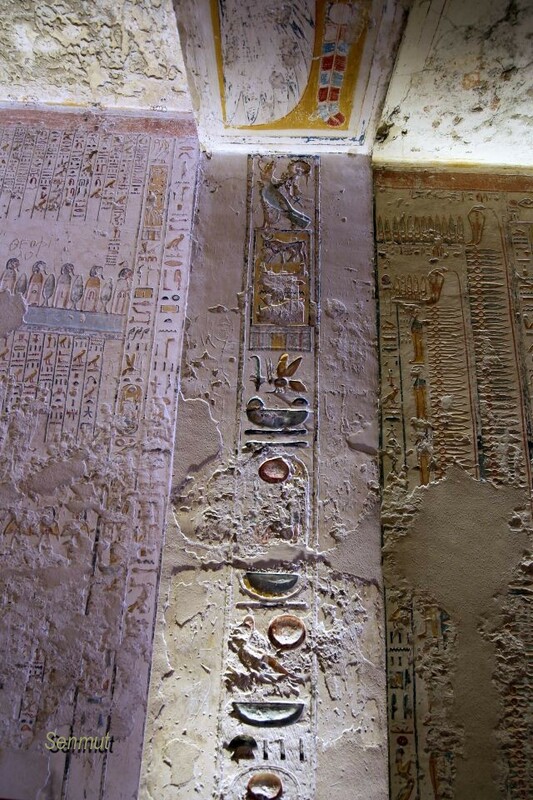 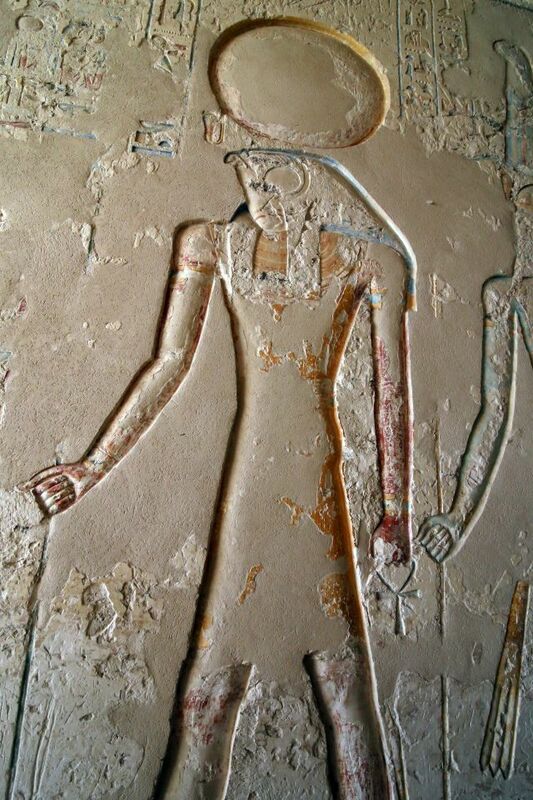 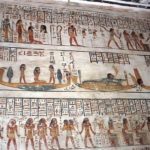 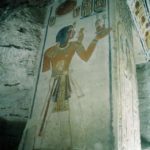 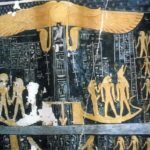 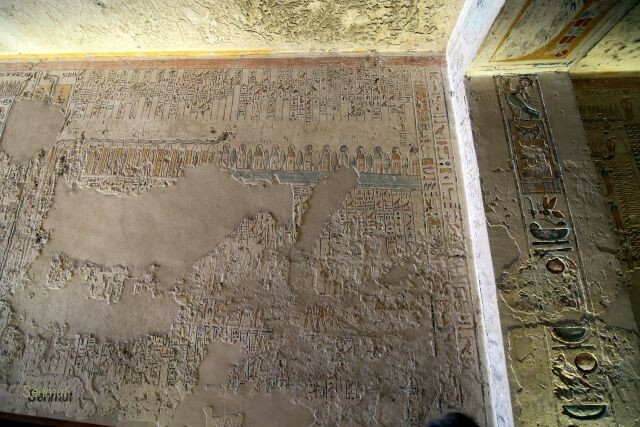 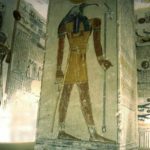 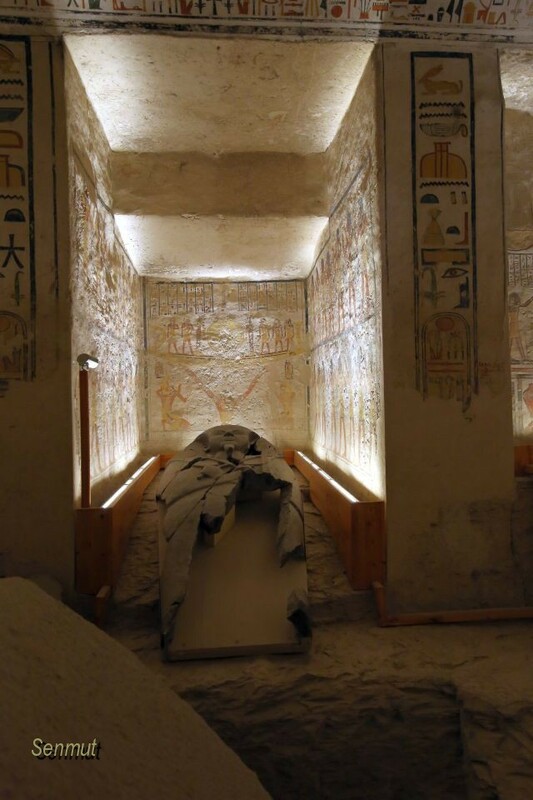 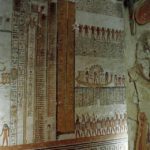 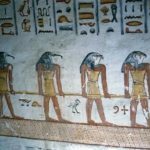 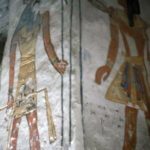 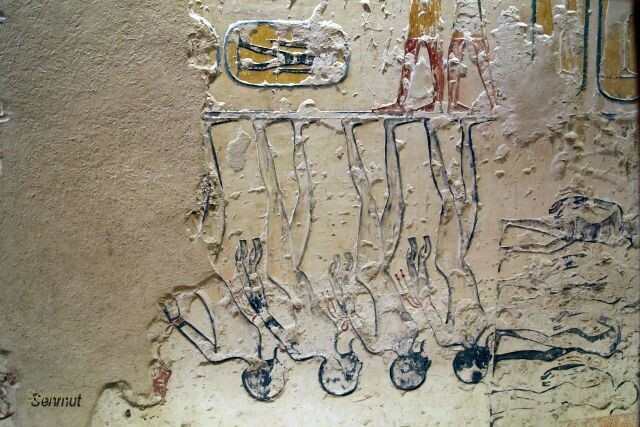 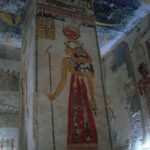 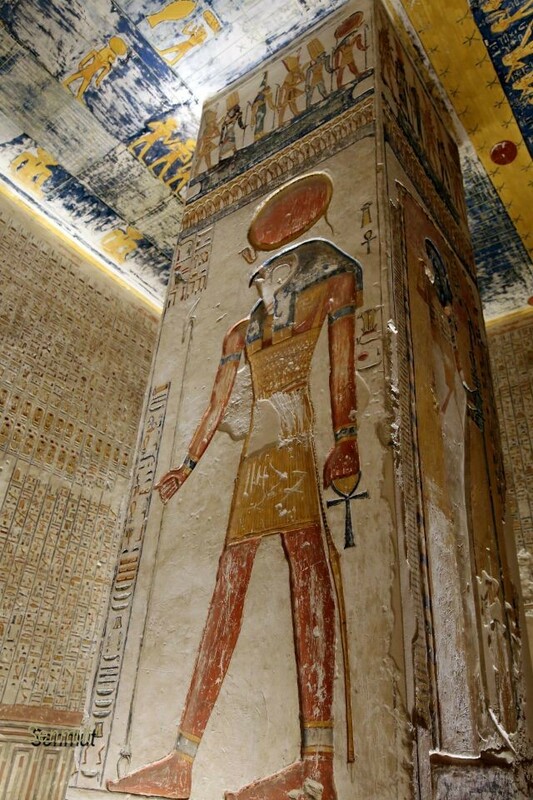 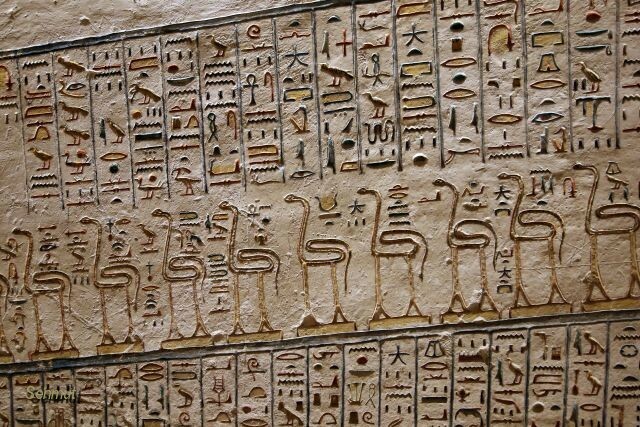 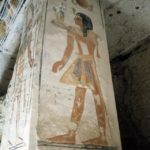 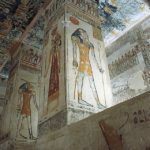 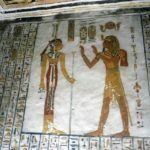 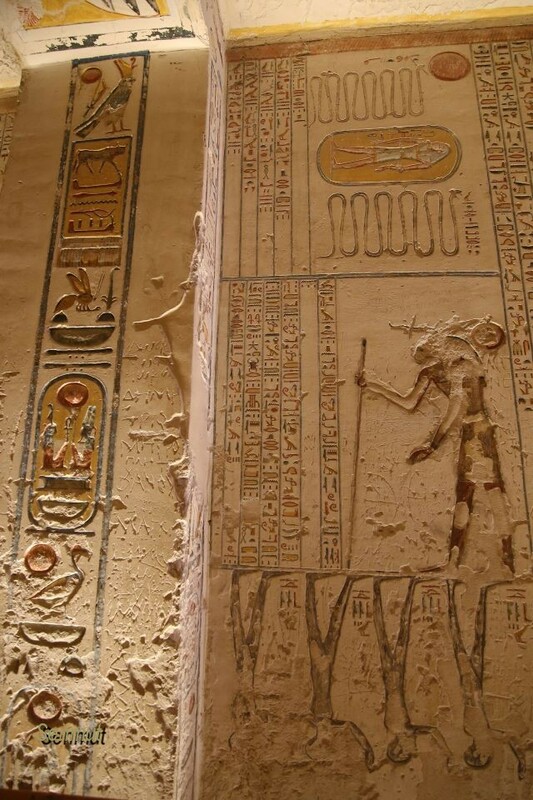 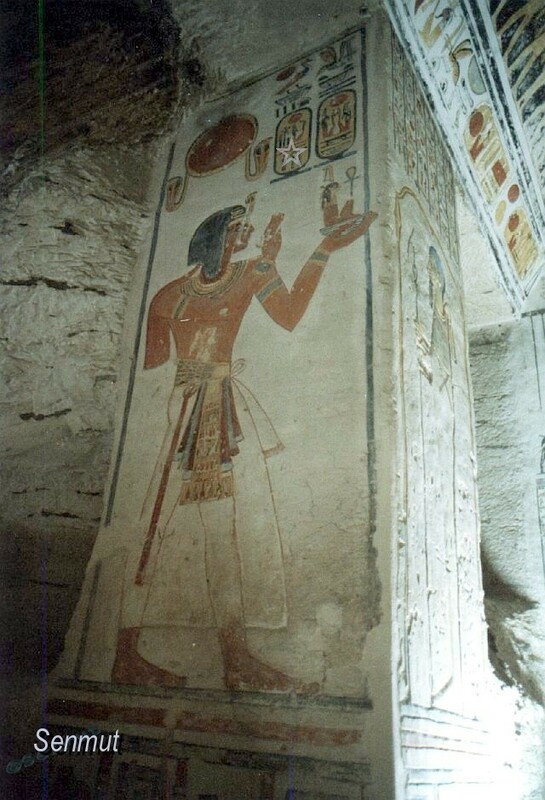 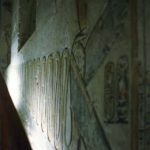 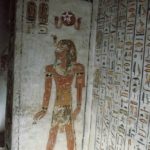 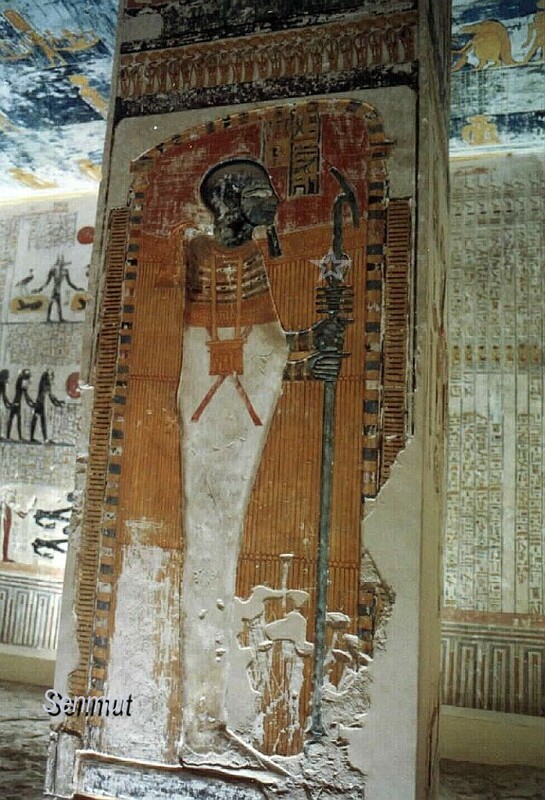 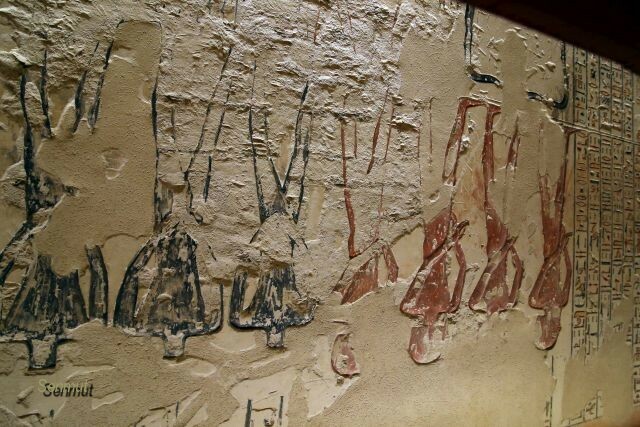 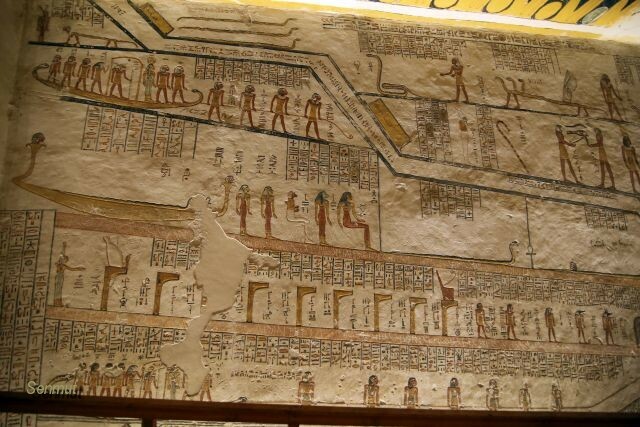 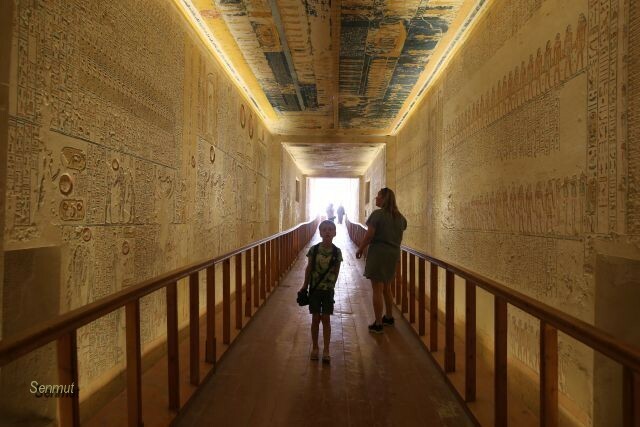 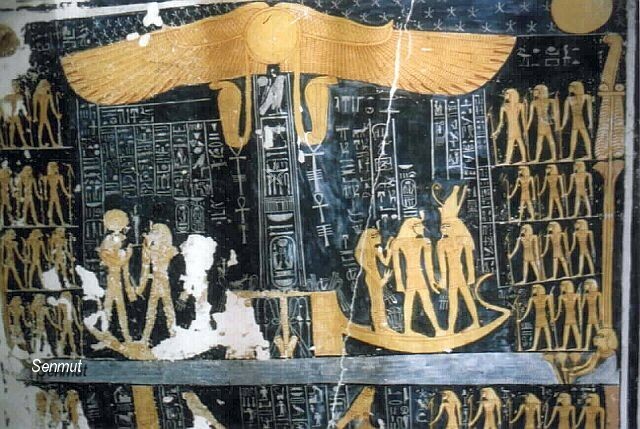 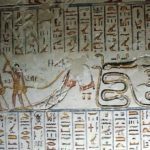 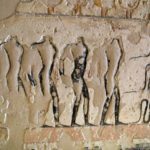 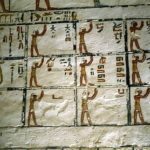 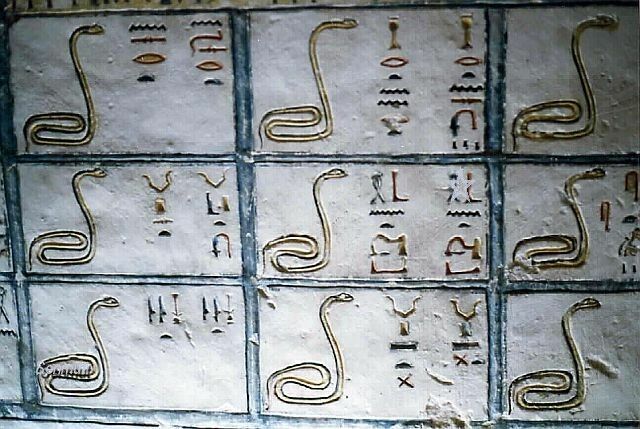 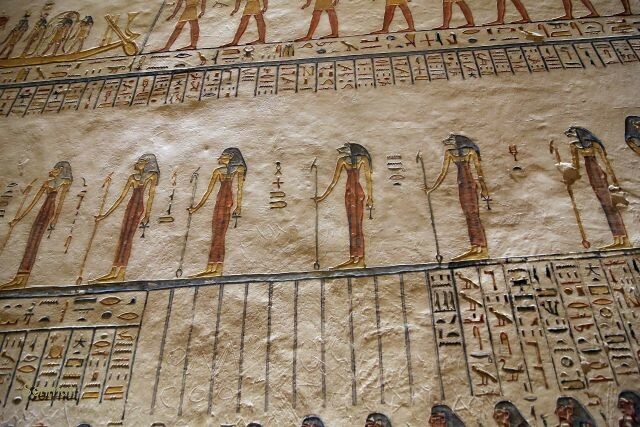 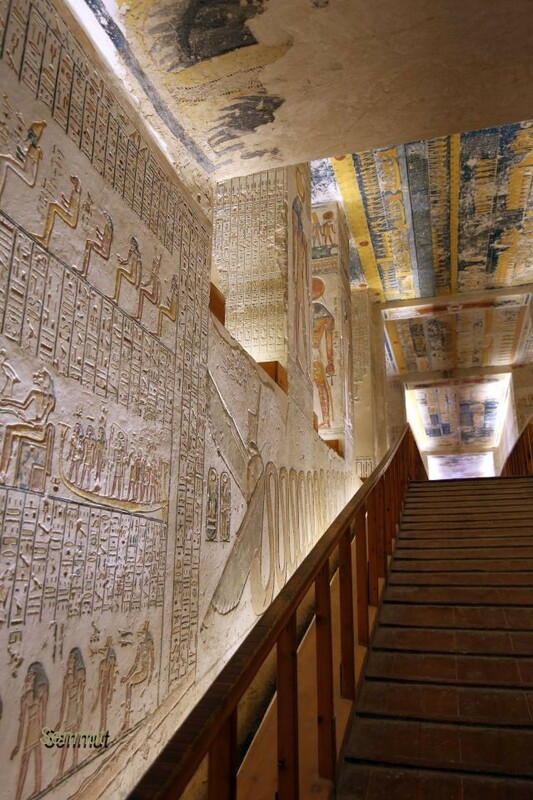 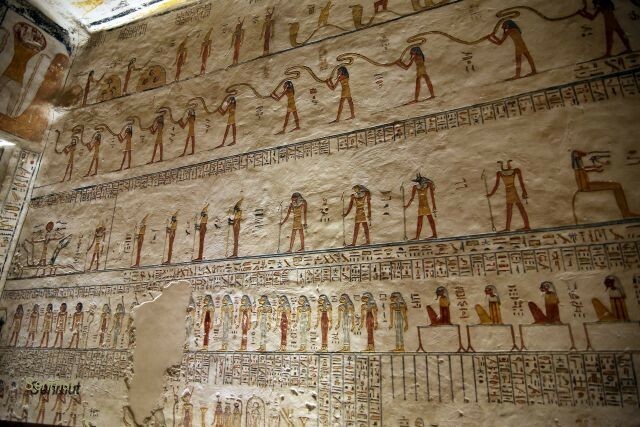 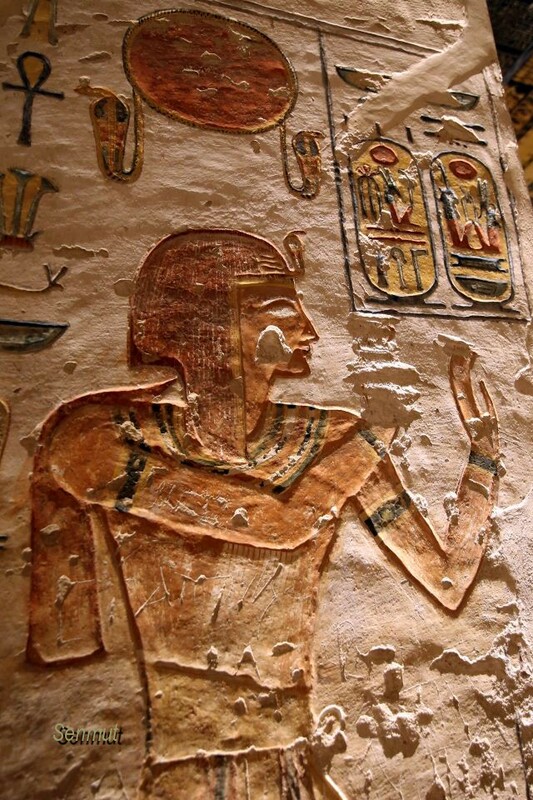 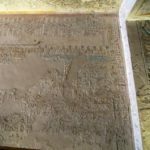 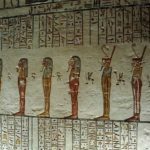 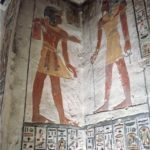 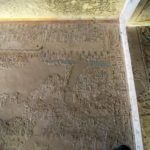 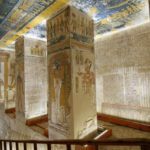 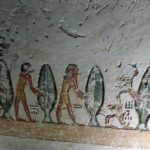 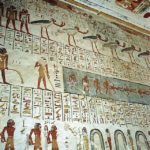 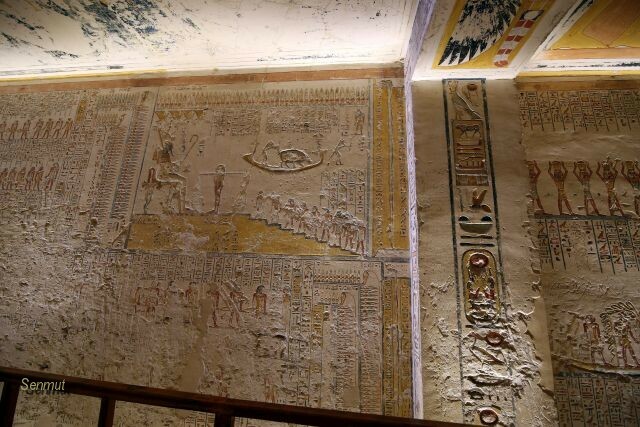 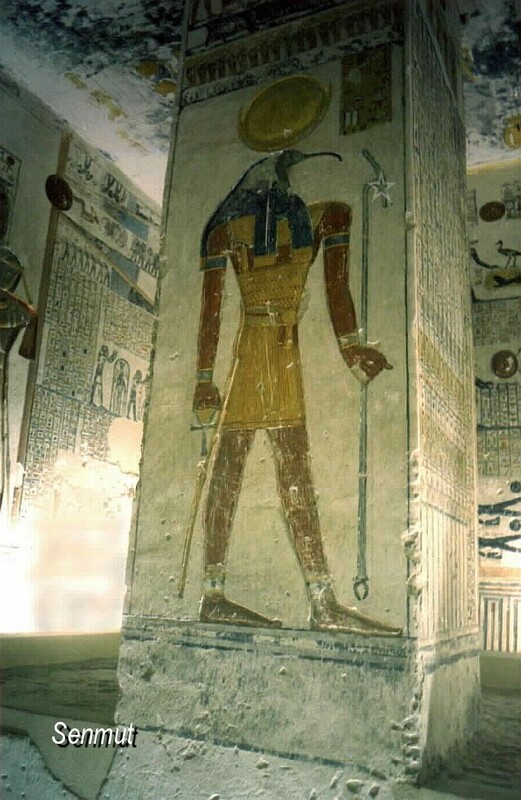 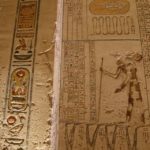 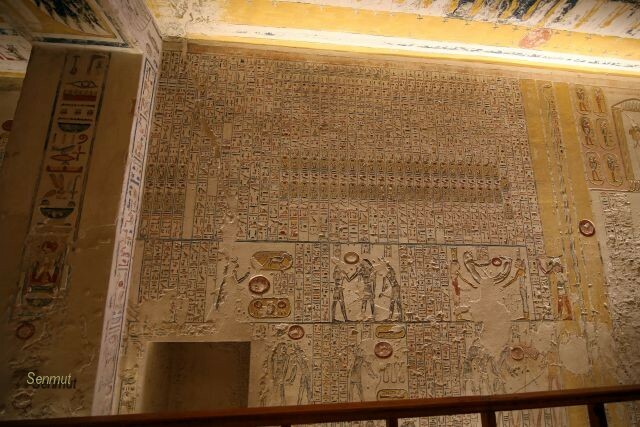 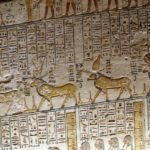 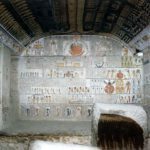 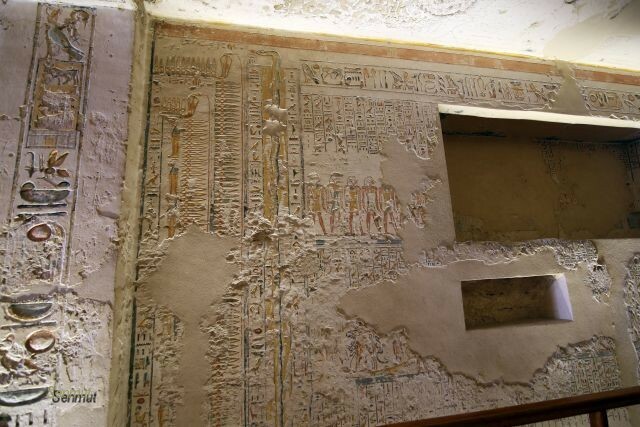 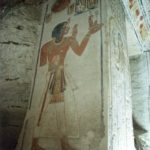 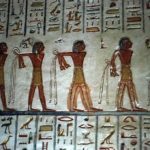 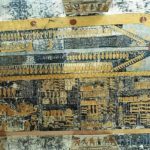 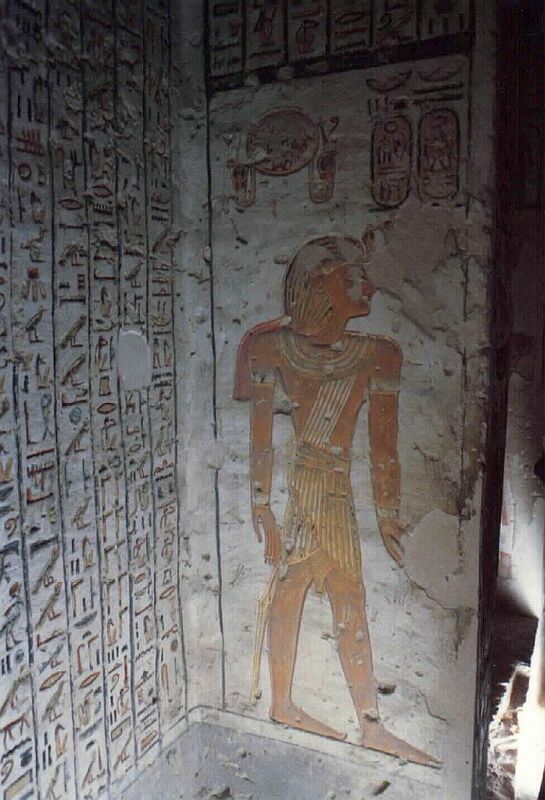 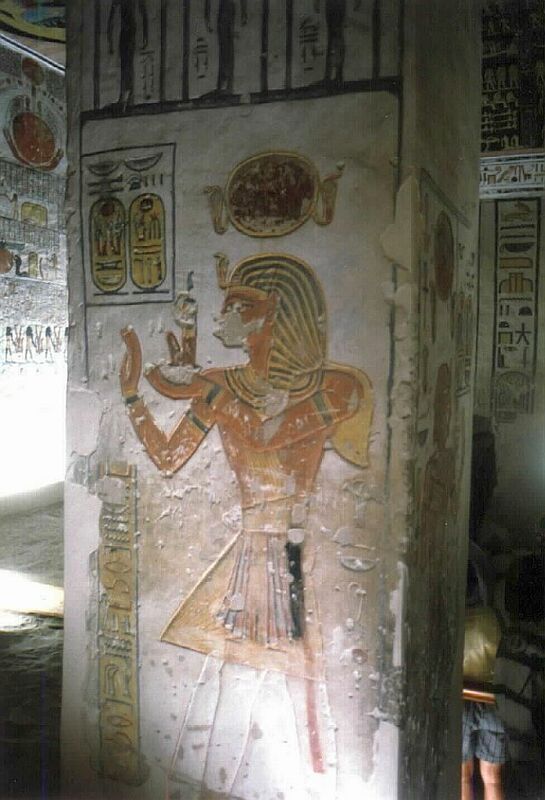 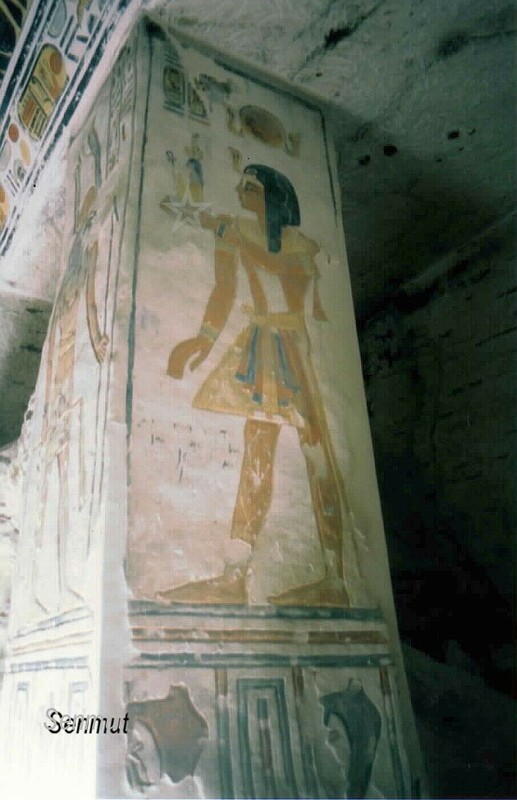 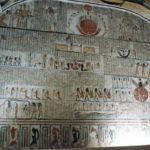 He usurped the unfinished tomb KV9 of his predecessor and used it for his own mummy. 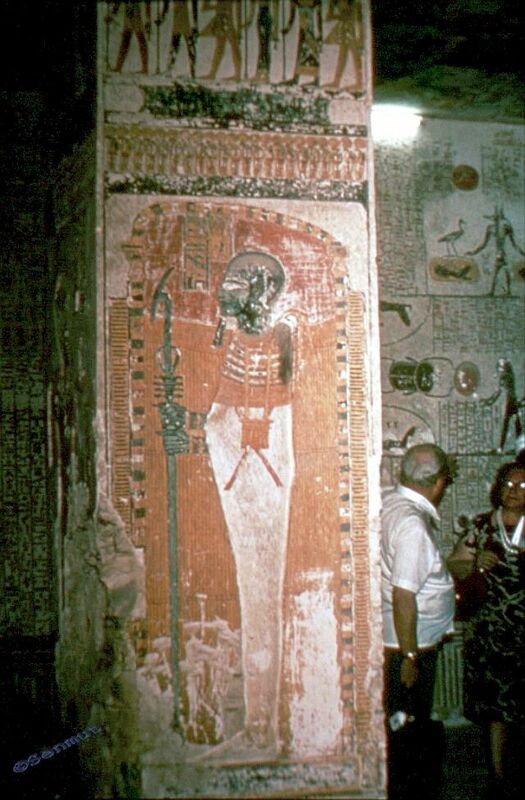 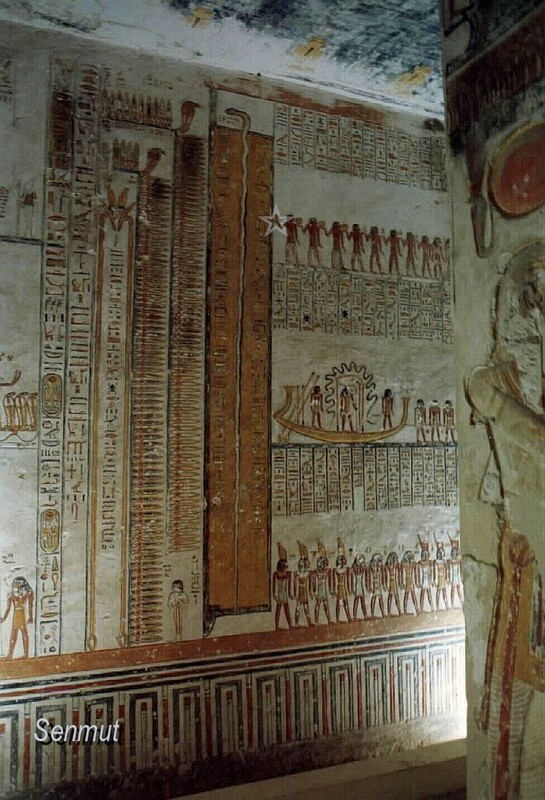 Besides KV17 (Seti I) this is probably one of the most speaking tombs of the Valley, because of its length, and spectacular colors. 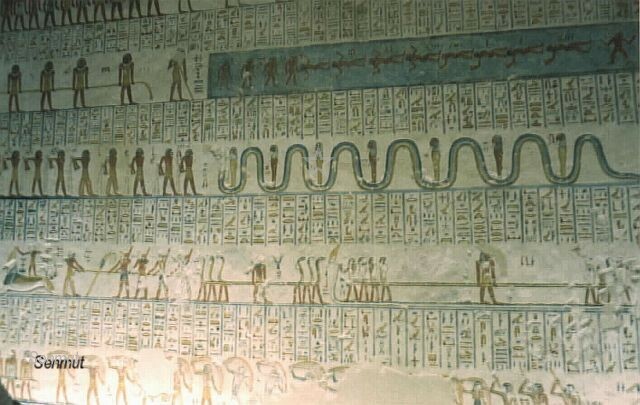 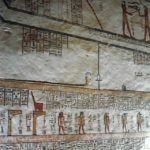 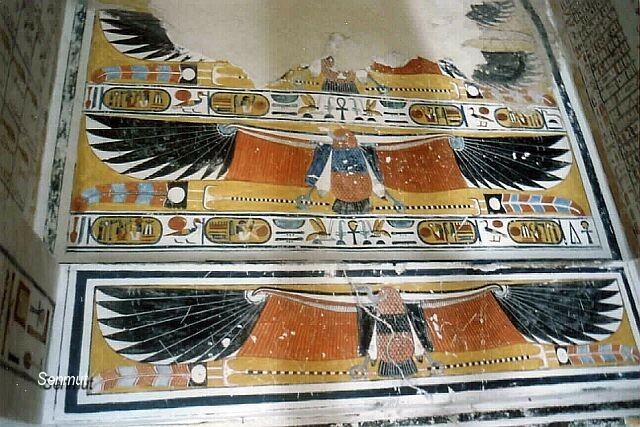 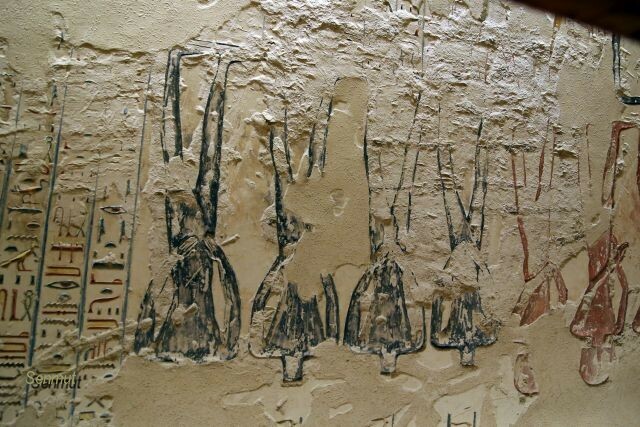 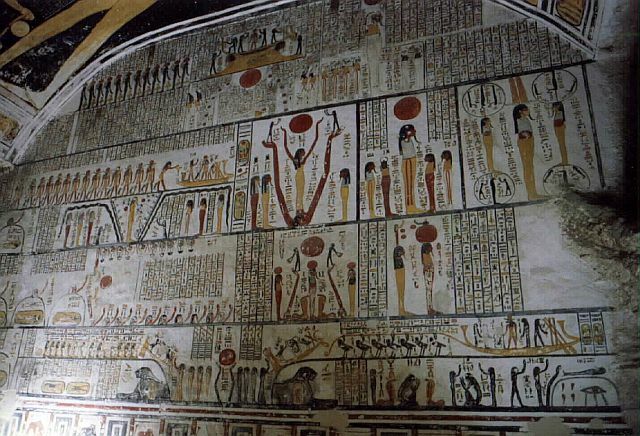 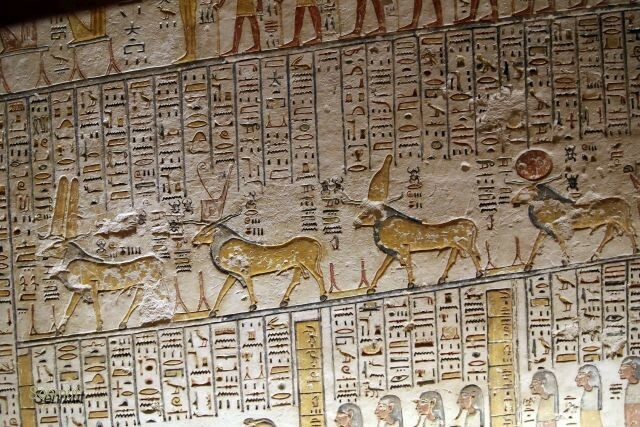 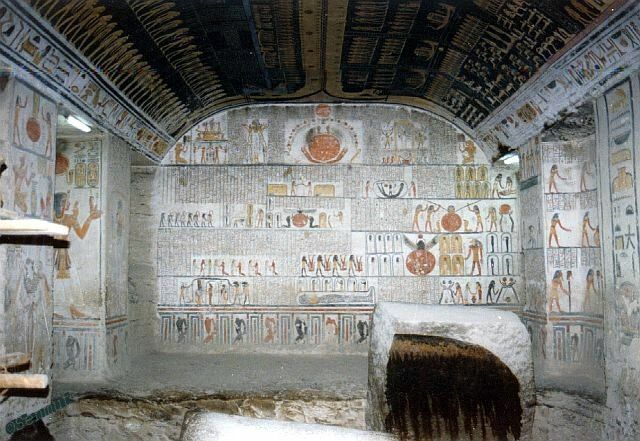 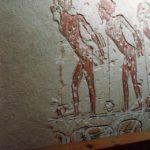 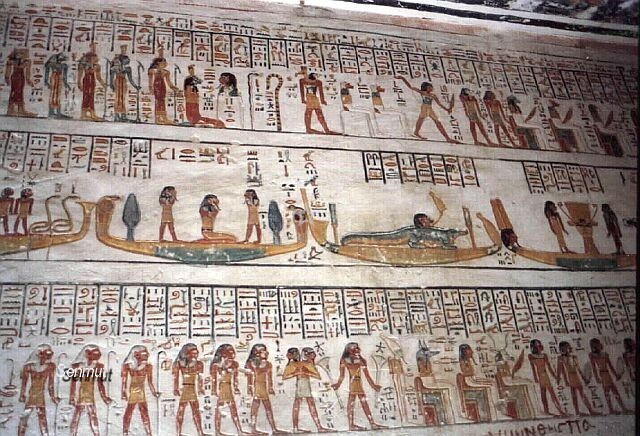 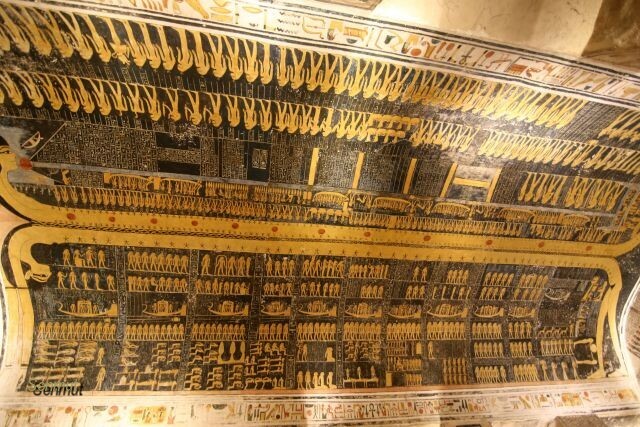 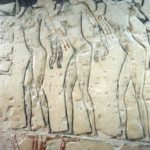 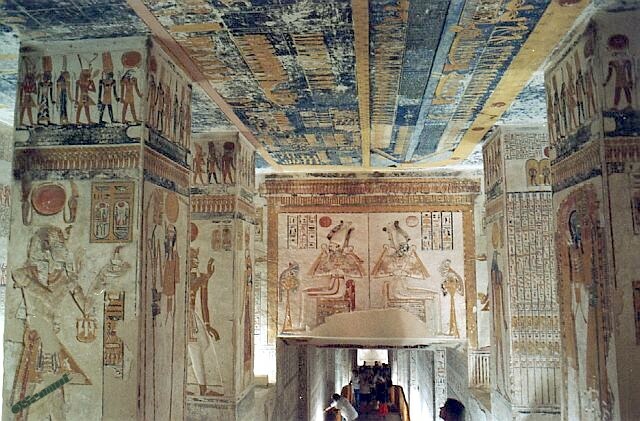 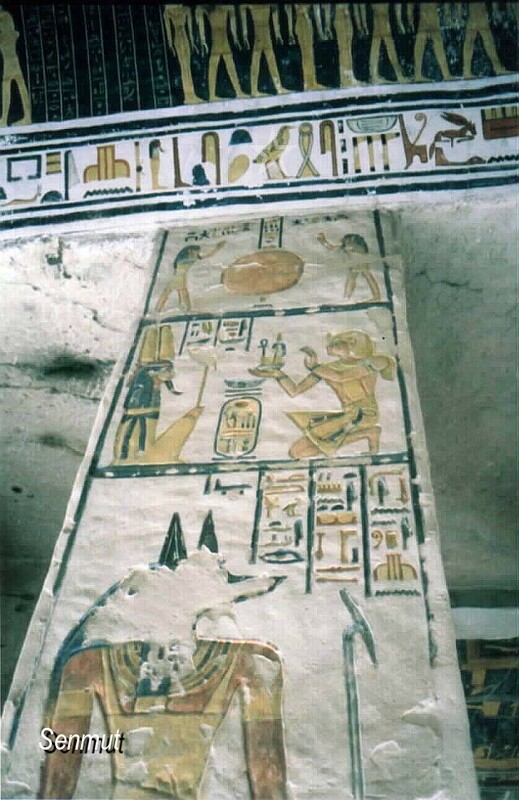 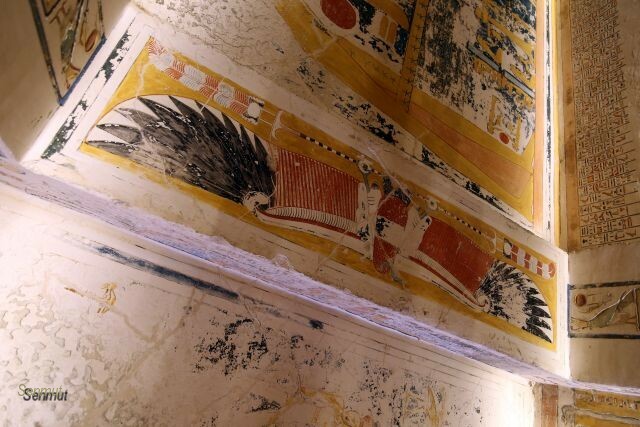 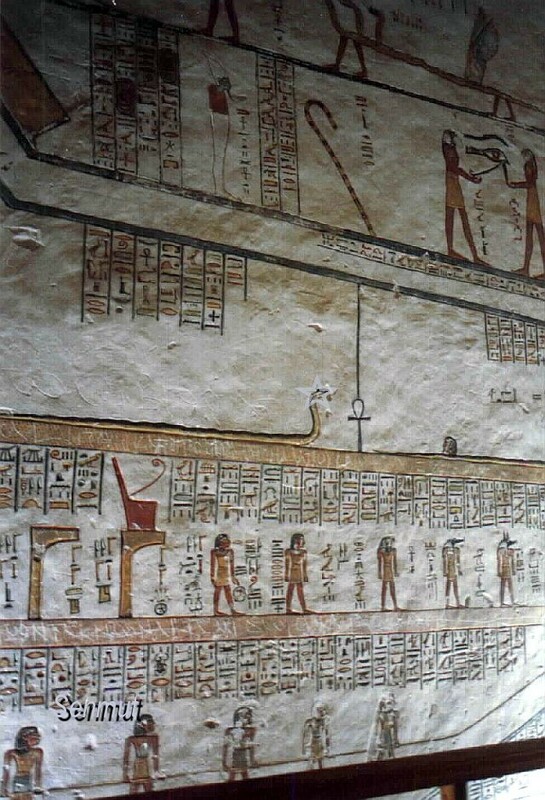 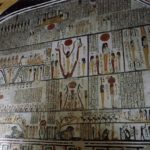 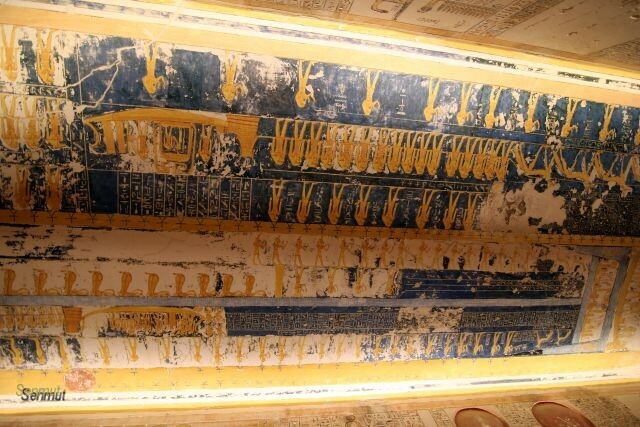 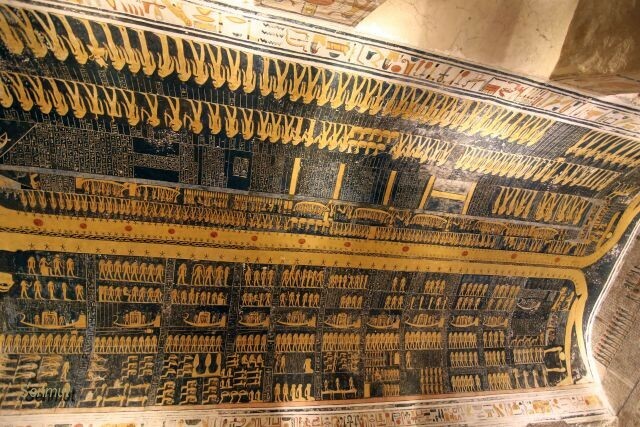 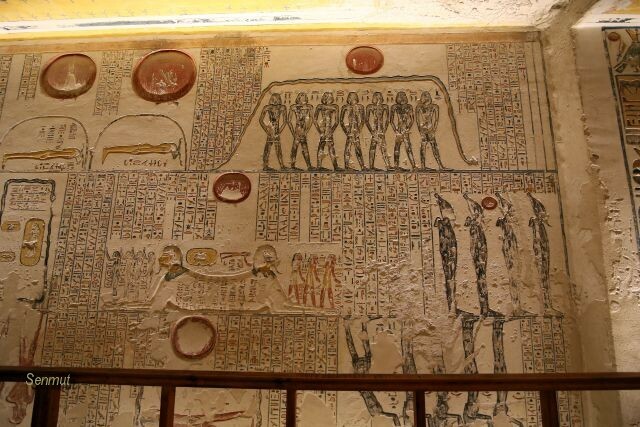 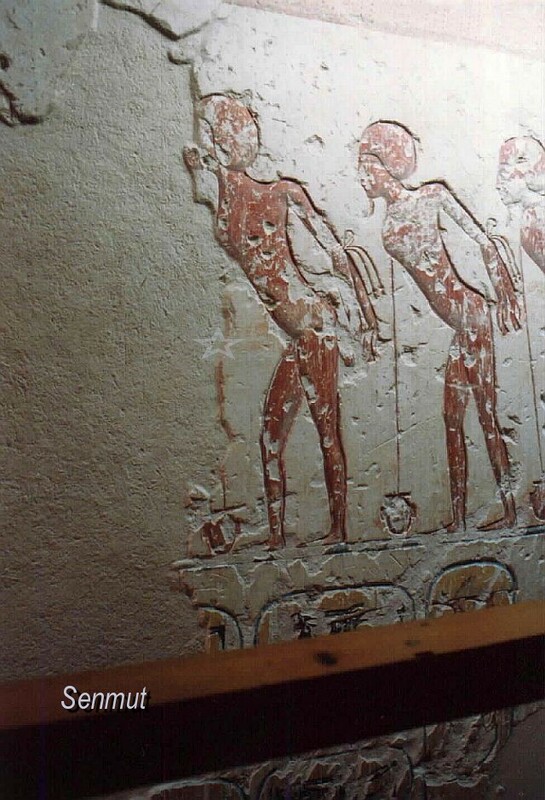 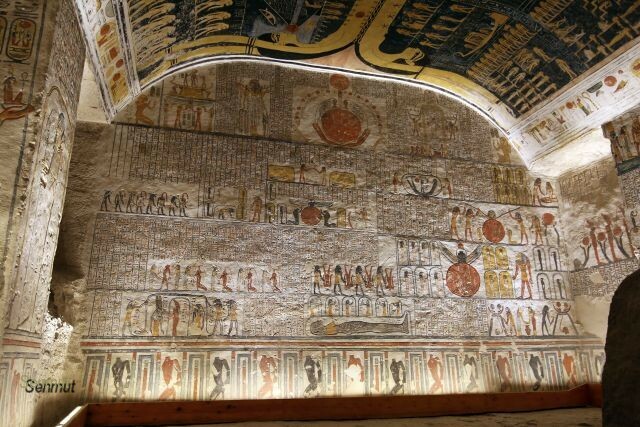 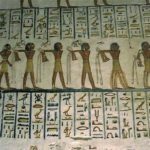 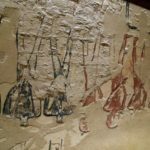 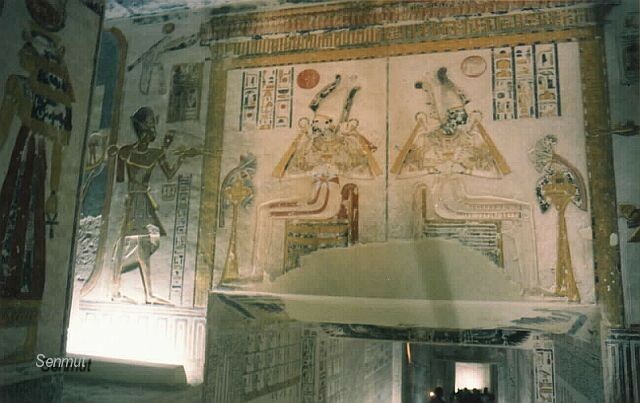 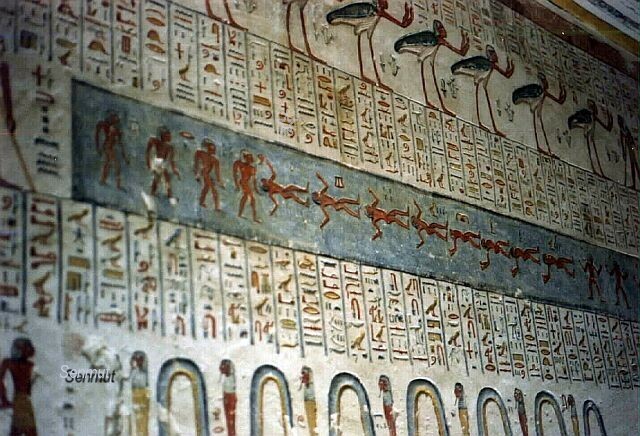 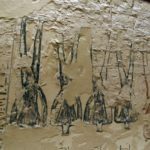 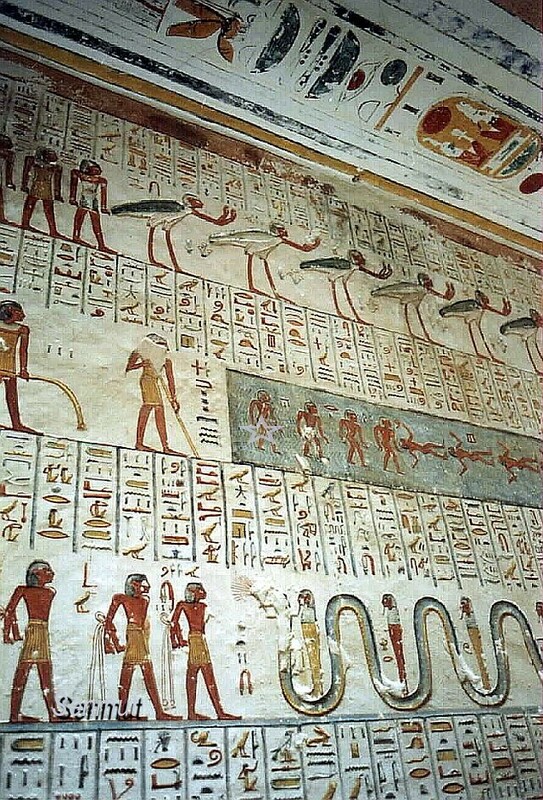 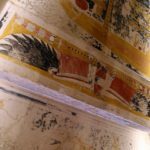 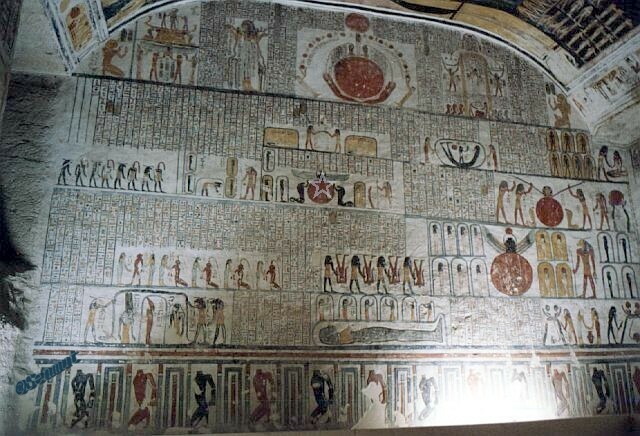 It is famous for its wonderful ceiling in the burial chamber. 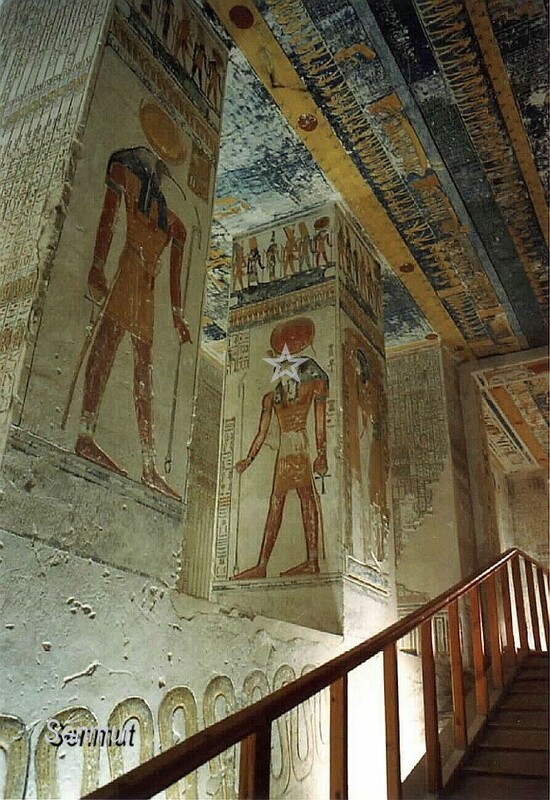 The decorations in the passageways are also very impressive, on the left The Book of the Gates and on the right The Book of the Caverns. 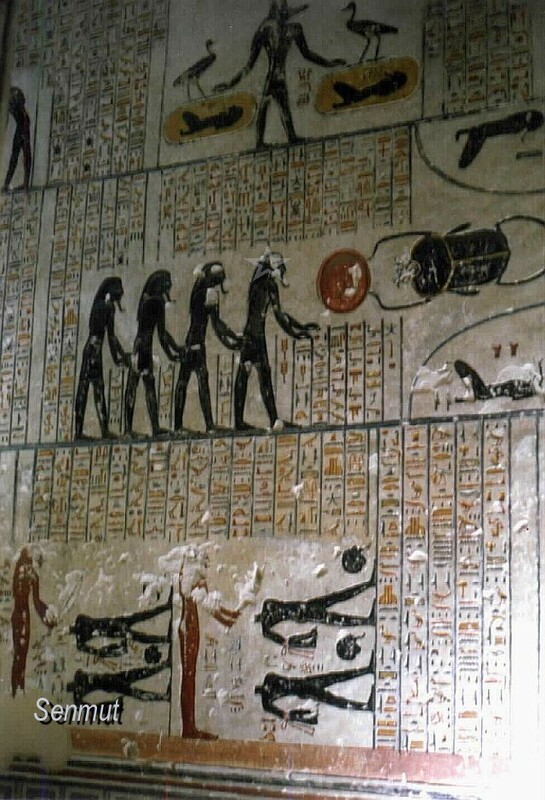 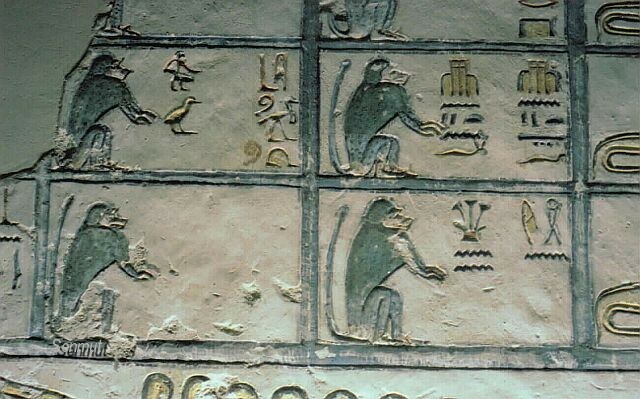 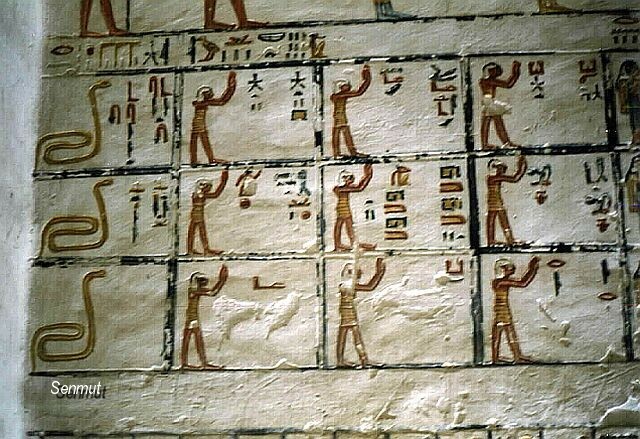 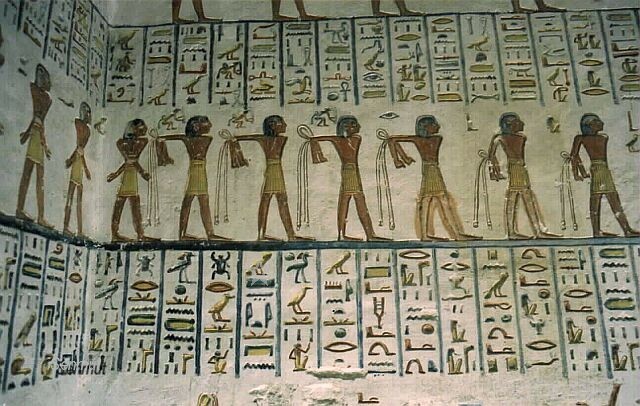 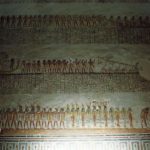 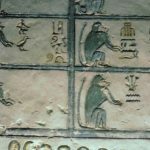 The lower passages scenes of Amduat and images of the Book of the Heavens. 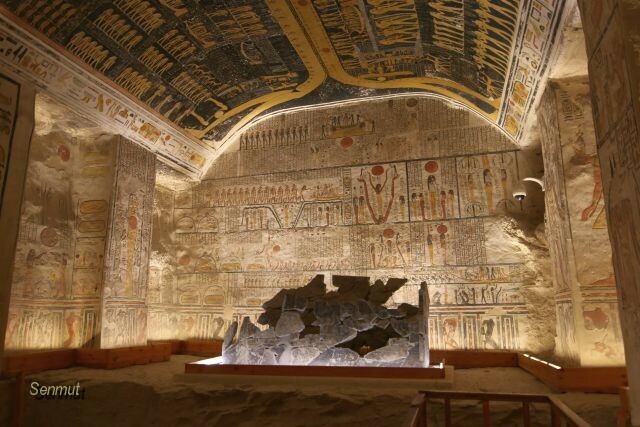 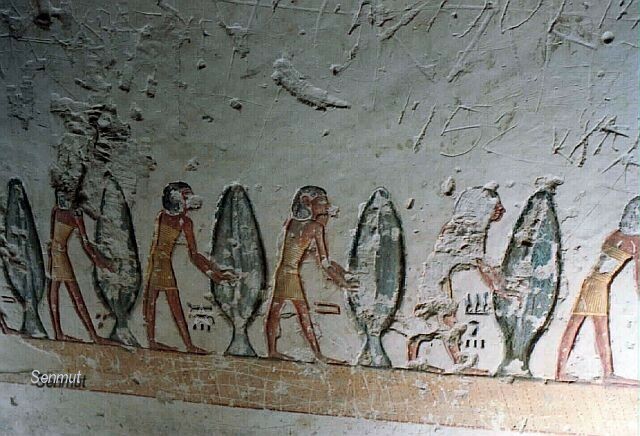 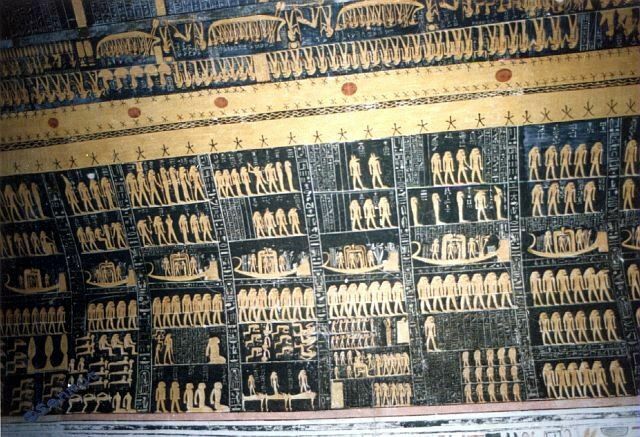 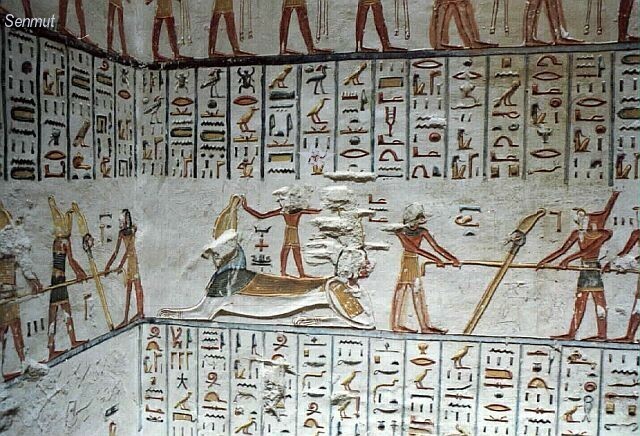 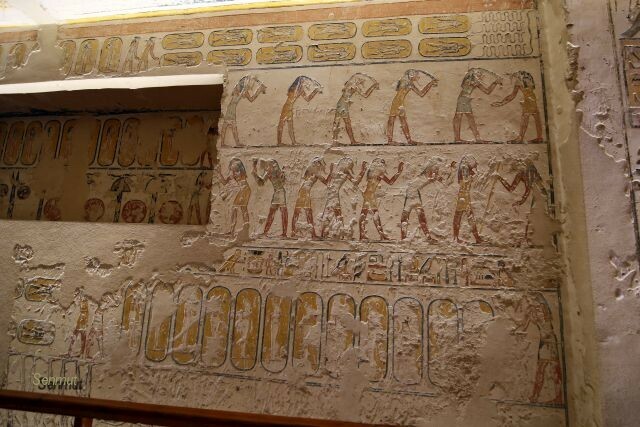 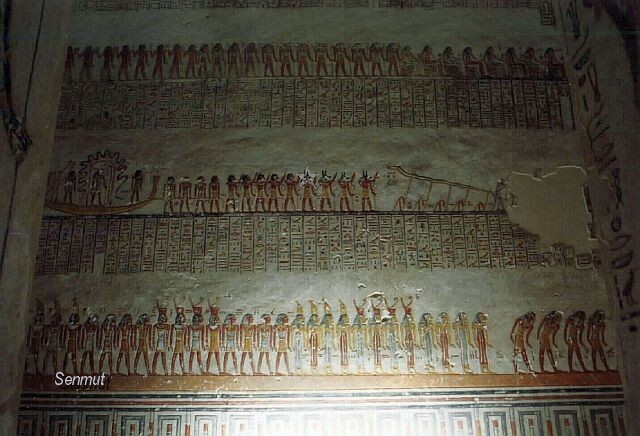 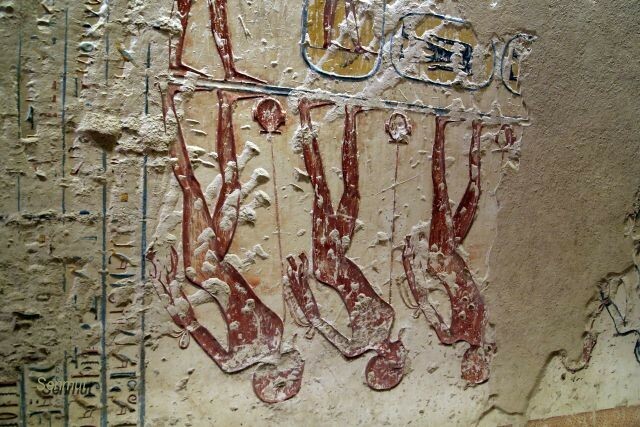 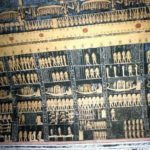 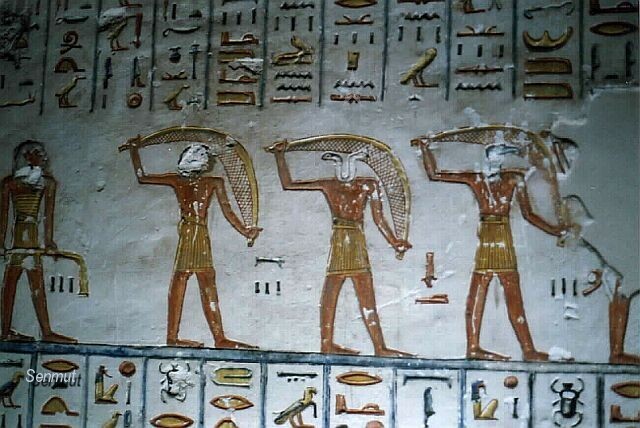 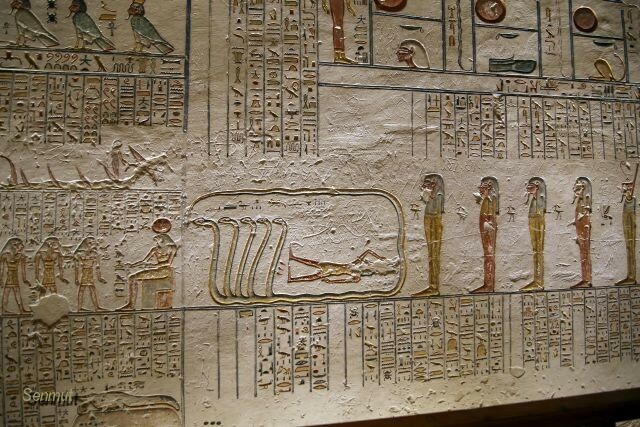 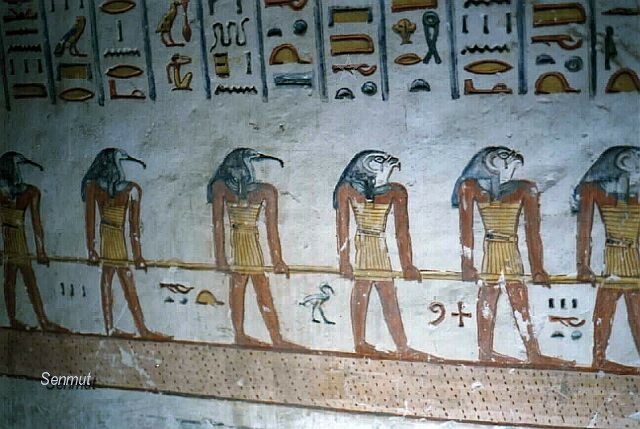 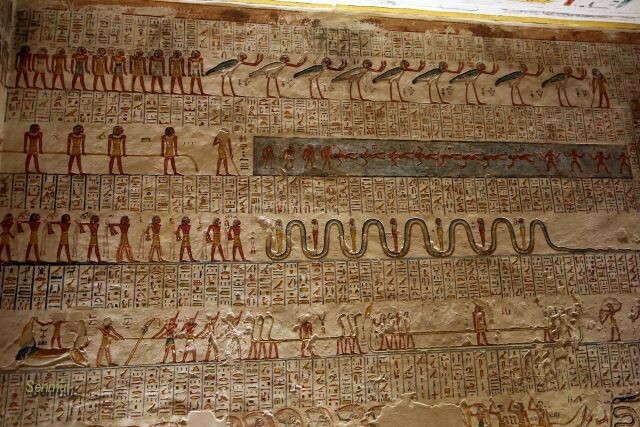 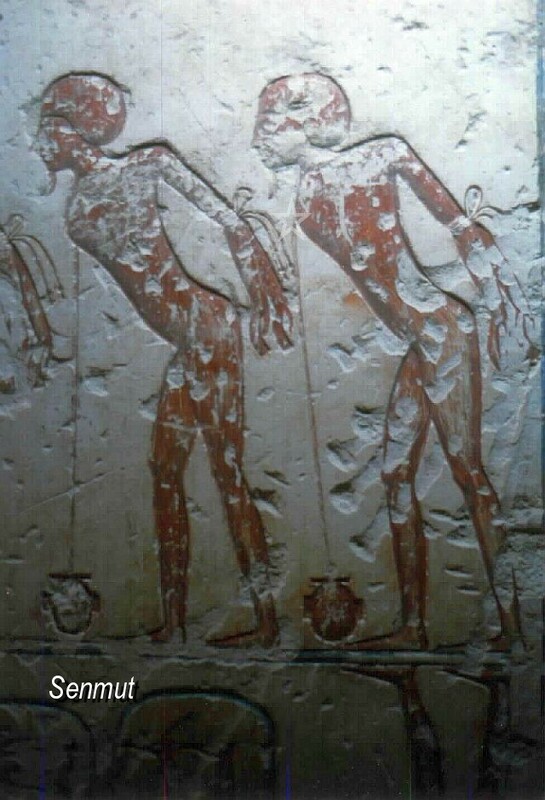 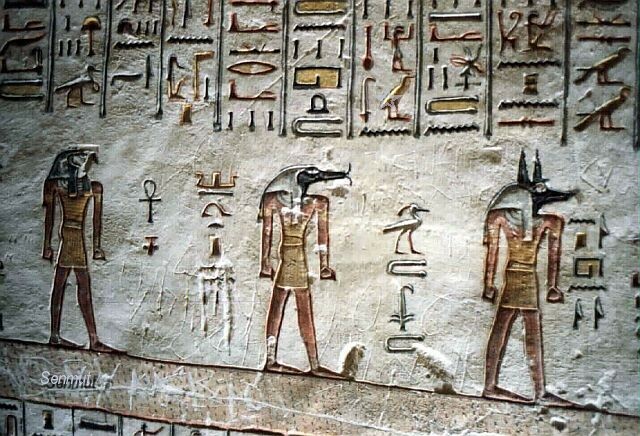 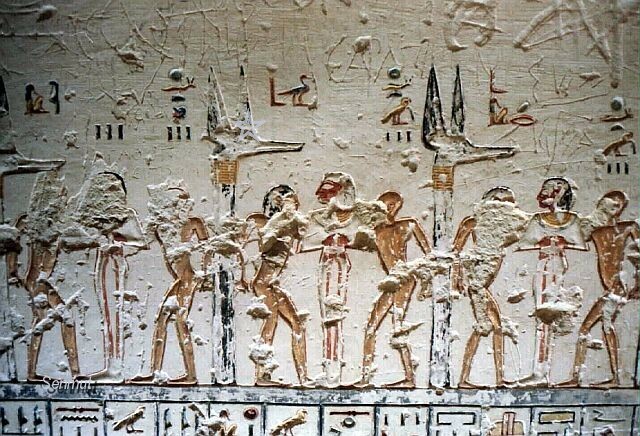 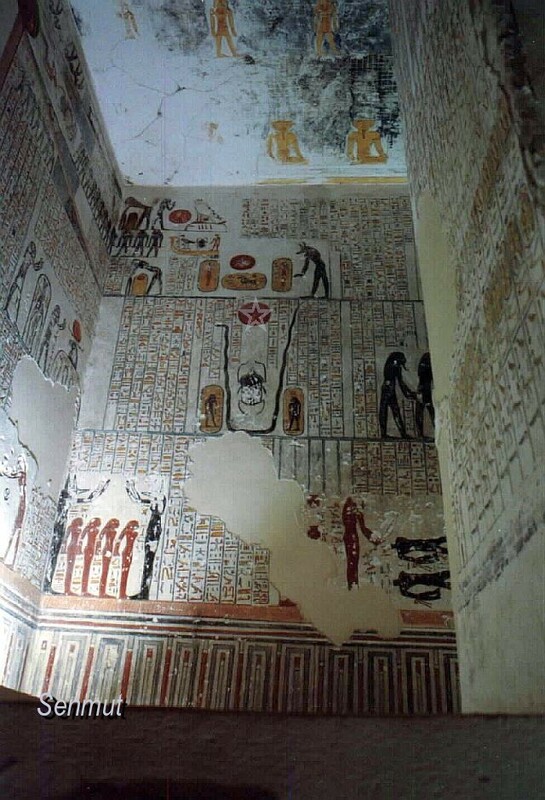 Shortly after he was interred the tomb was plundered, and the mummy cut in pieces in order to retrieve the jewelry. 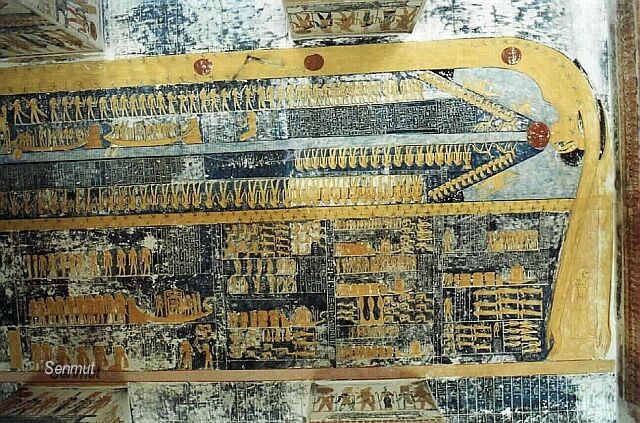 It finally was removed from KV9, and after restorations put in the cache KV35. 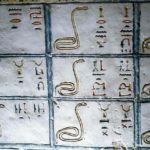 Its possible again !!! 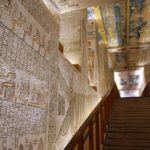 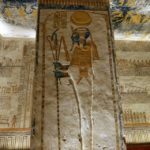 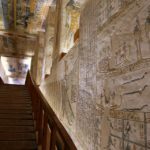 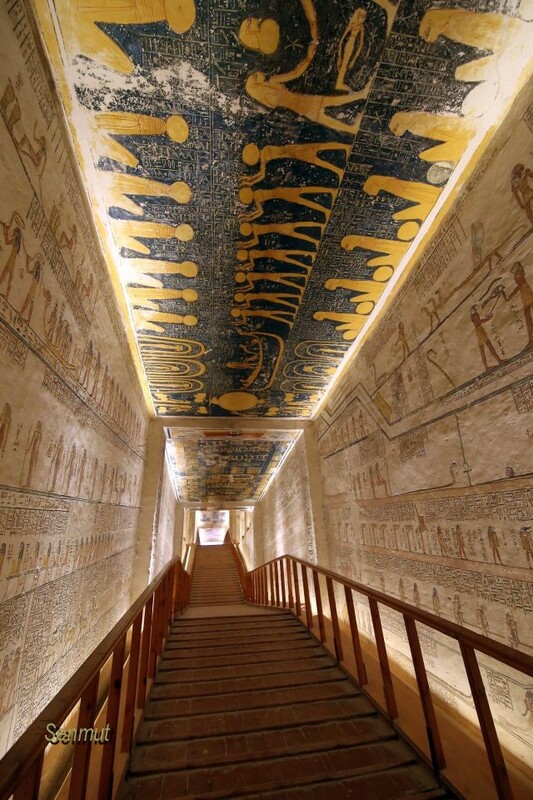 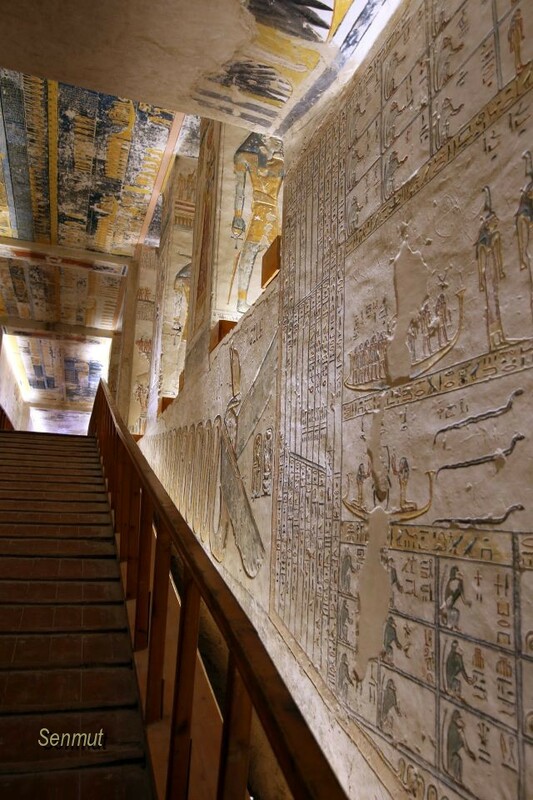 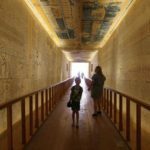 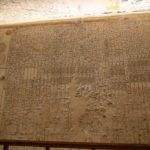 For an amount of LE300 you can legally take pictures again in the Valley of the Kings. 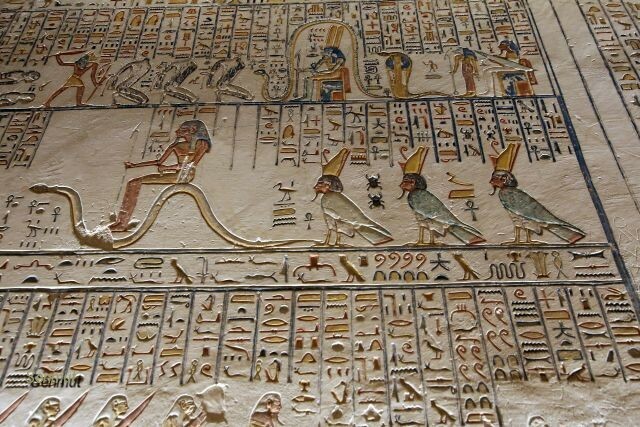 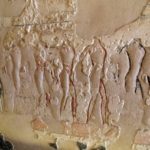 My sincere gratitude to the Ministry of Antiquities.